Friday- I forgot to add Friday to last weeks blog!! Oh well, I can claim being sick. I had PT this morning at 8:00 instead of 8:30. 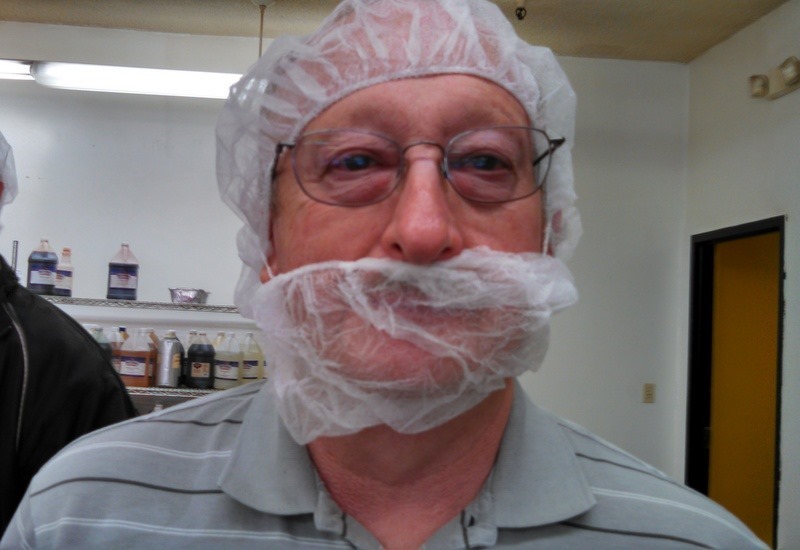 I returned to the motor home and we went to the South Bend Chocolate Factory for the tour. Since we were there for the 11 AM tour, we missed the school kids. They started arriving at about 11:30. The tour was very interesting. 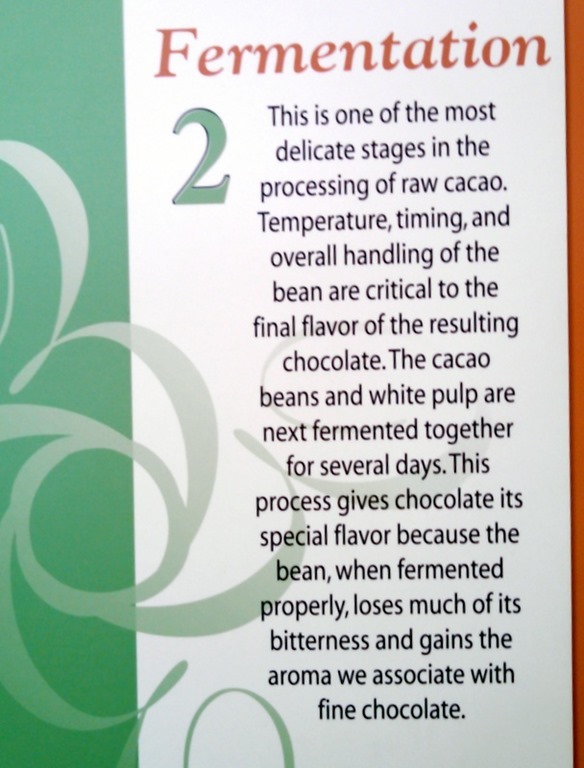 We have been on chocolate factory tours in the past, but to me this seems a little better than the other tours. 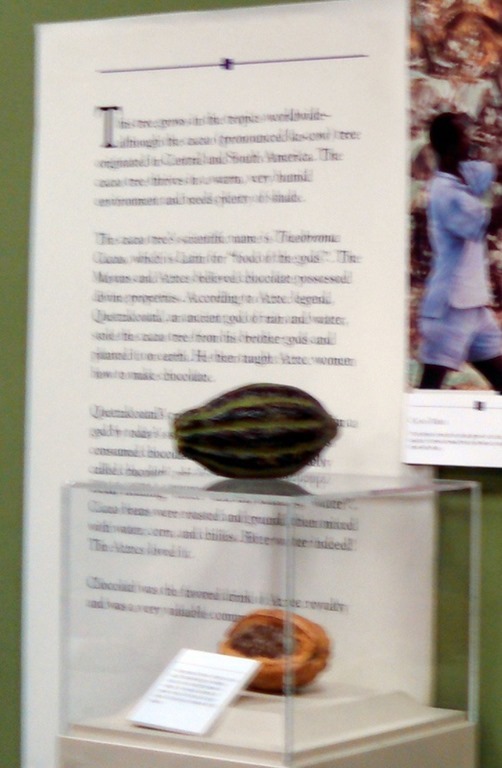 Since we were a little early, we went to the Chocolate Museum ( free) and walked around looking at the exhibits. 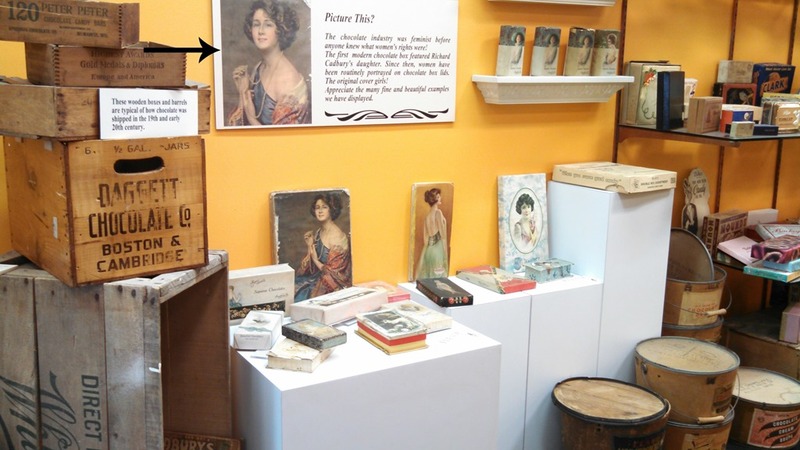 They advertise that it is one of the largest Chocolate Museums in the country. It was fun looking at chocolate company names. 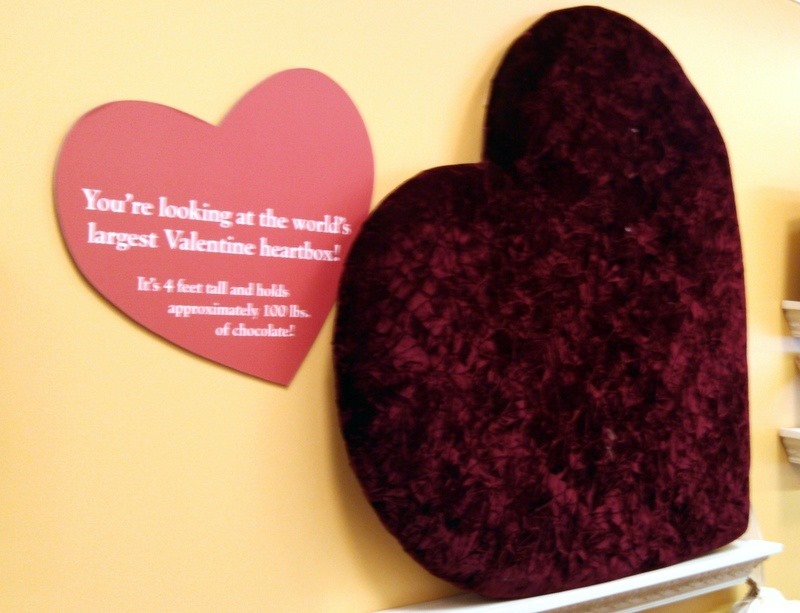 Below is the largest chocolate heart box. 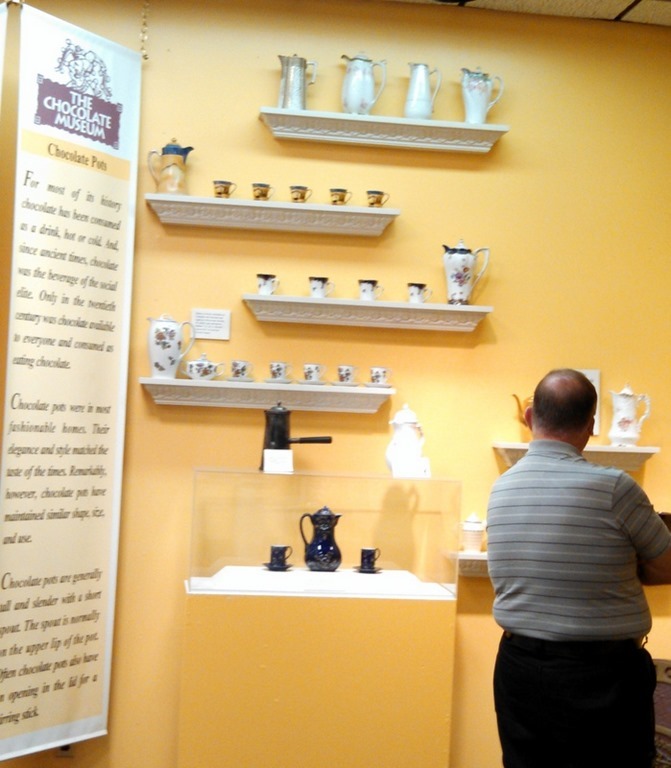 Above is the hot chocolate set exhibit. 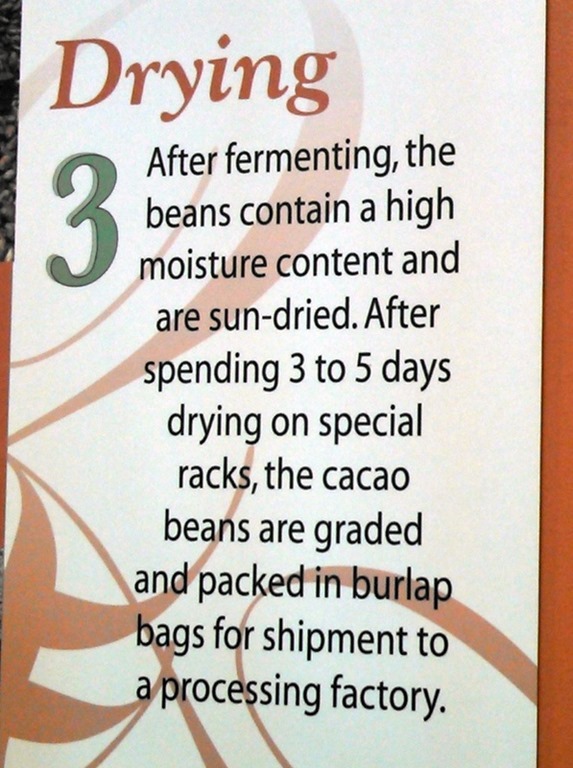 Below the Chocolate Producers in Indiana. 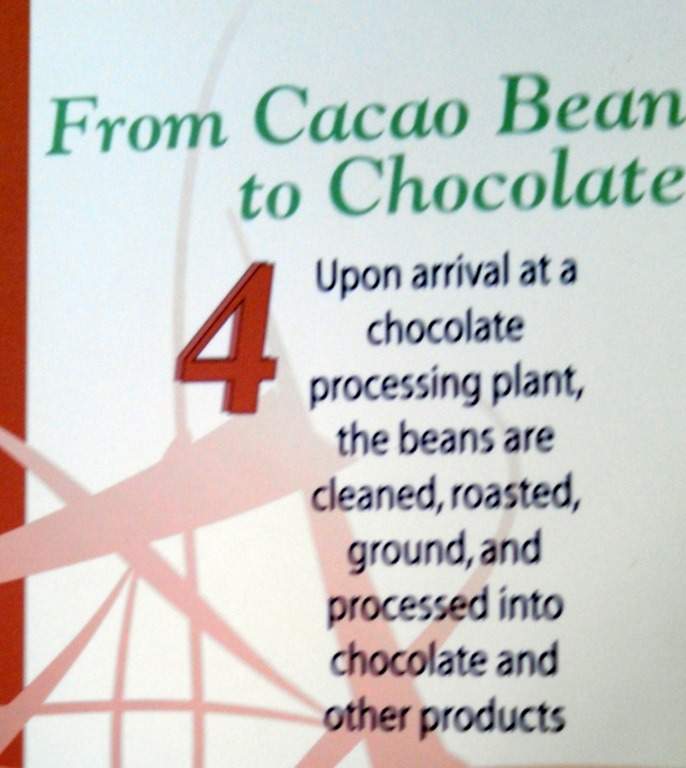 Who knew that Indiana was not only an automotive center, it was and is also a chocolate producer! 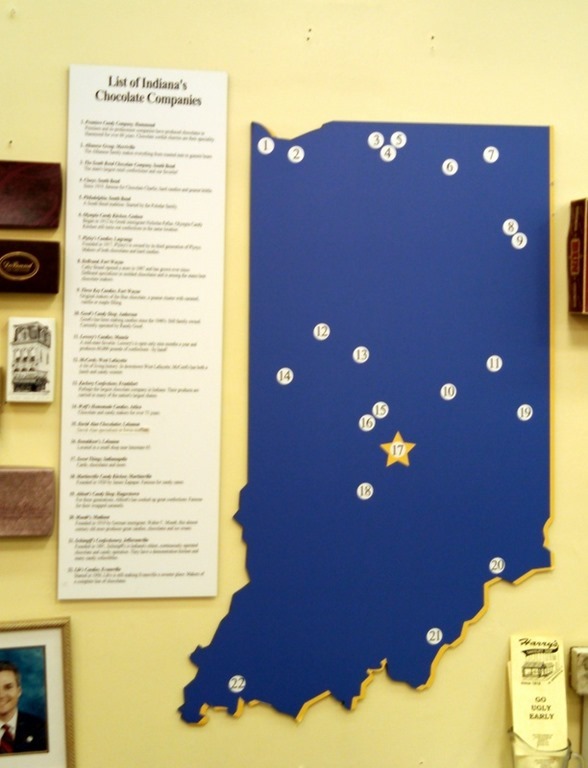 Chicago is a real chocolate town, and South Bend is not far away. At 11 we wandered over to the lobby where the tour started. 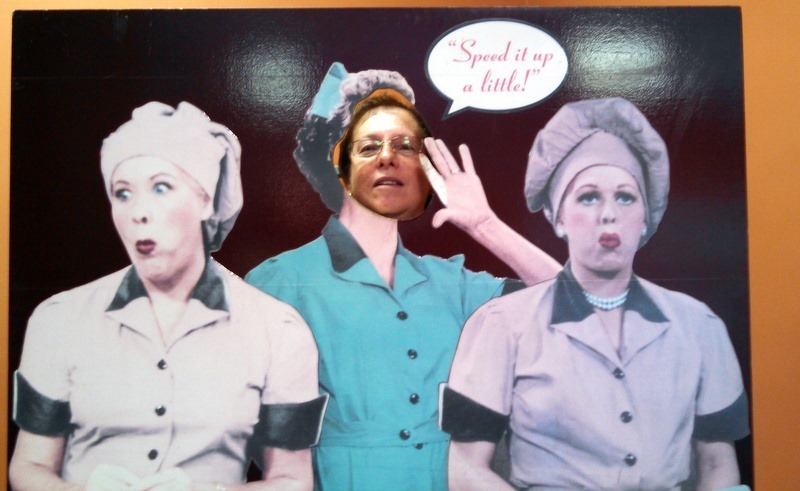 A chocolate factory tour would not be complete without Lucy and Ethel! Here was our tour guide, Captain Crunch! Note the fashionable hair cover. Here is Bob in his hair and mustache cover! Yeah, Capt. Crunch actually made him wear a mustache cover! Capt. Crunch started the tour by telling us about where chocolate comes from and how it is produced. 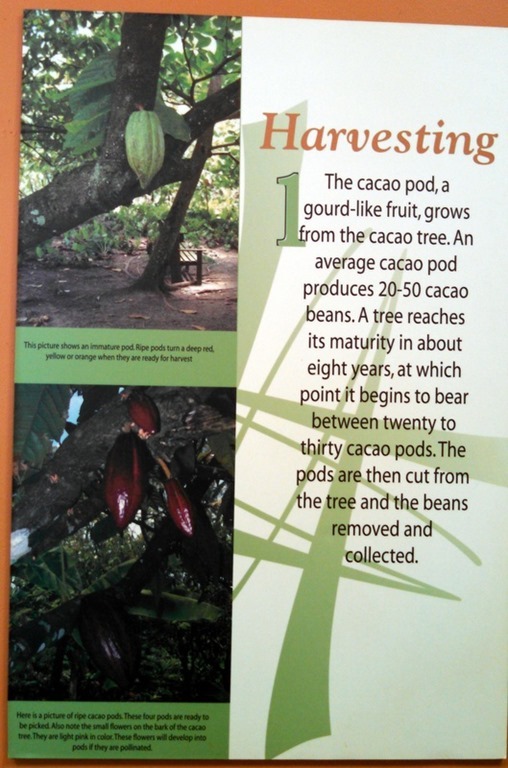 This is the pod that has the cocoa beans in it. 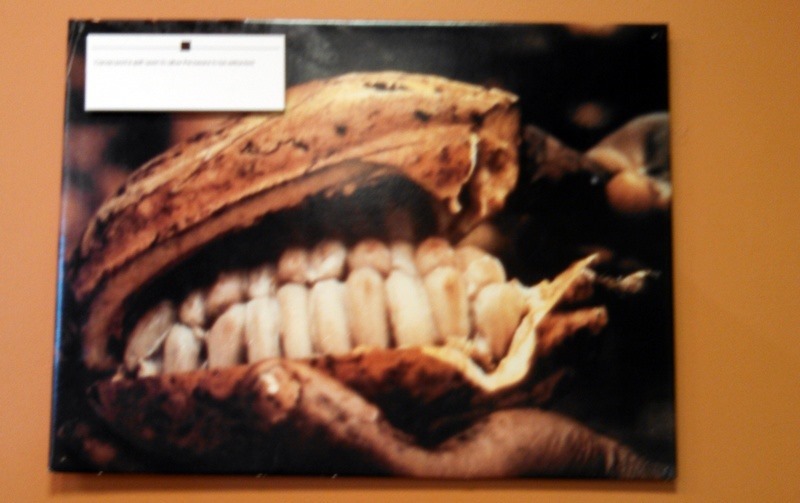 The white “teeth” are the coca beans. We moved from the entrance way into the actual processing plant. We all had the silly head covers on. Friday was ‘turtle day” so these are cooling turtles,(above) prior to the application of the chocolate. 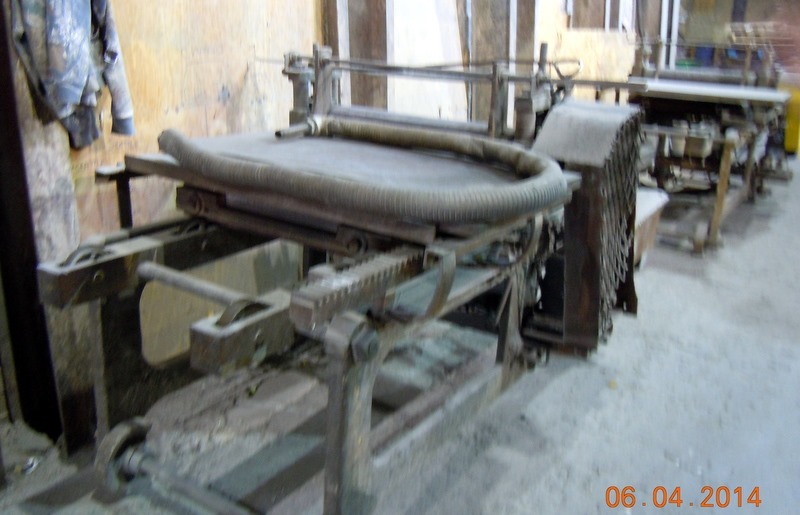 Below, are the turtles going through the machine which applies the chocolate. Do I need to tell you how good this smelled? The tour was only 40 minutes and Capt. Crunch gave us some free samples and took us to the packing room. There is a $4 tour ( we took the free tour) ; the rest of the folks who were in the paid tour then rec’d more chocolate and watching them dip spoons into chocolate. 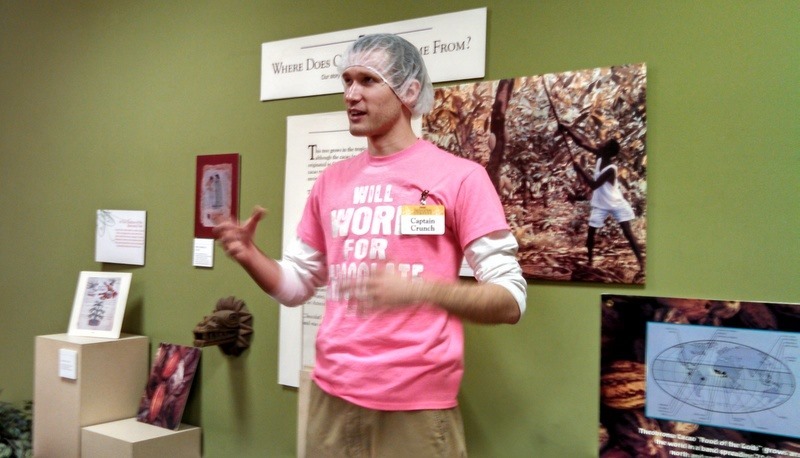 Before we left the tour, our guide showed us some of the molded chocolate. 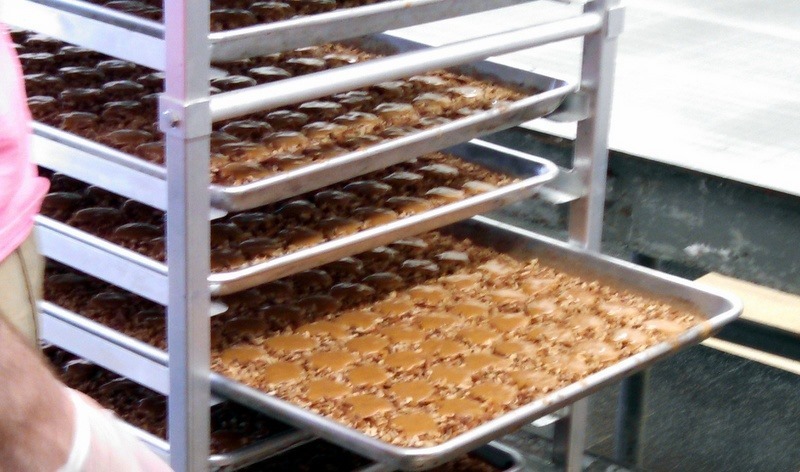 South Bend supplies lots of molded chocolate to Notre Dame; Notre Dame was their first customer! 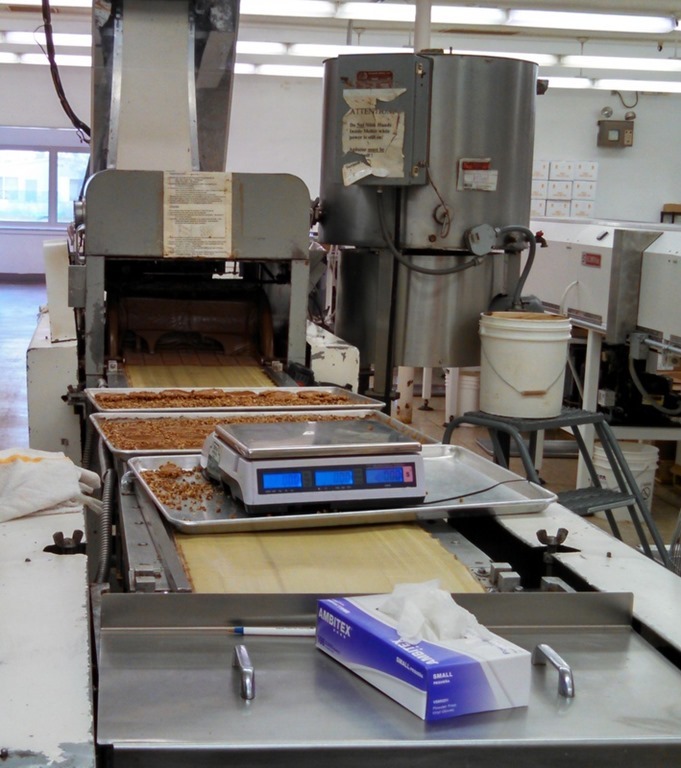 South Bend Chocolate opened in 1978 and is being run by the second generation. They not only have this plant; they also have the Chocolate Café in downtown South Bend, which we will have to check out. In addition, they also have stores across Indiana and a couple in Ohio. In the factory store/gift shop, they had a long counter of seconds. The seconds sell for $8.99 lb. The regular chocolate sells for $19.99. We bought a pound of the “seconds”. Just because they did not look perfect, did not mean they did not taste great! We returned home to the apartment, ate lunch, and took a nap. When we woke up, my stomach was still bothering me. My tummy had been tender to touch and I had a burning pain in my stomach for the last two days. Because I am at an increased risk of a bleeding ulcer, we decided I needed to be seen by a doctor. We looked for an urgent care in the area and there was none in my insurance plan, so Bob took me to the Memorial Hospital ER, which is participating in my insurance. The experience was positive, even if it hurt for the MD to palpate my abdomen. I had a CAT scan, which was negative. The MD decided that my stomach was irritated and sent me home with some prescriptions. Overnight, Bob developed the same symptoms, and we decided the whole thing was a virus of some type. Better safe than sorry. Saturday- Since both of us felt lousy, we spent most of the day at home, sleeping, watching TV and reading. At about 6:45 AM, a band had started playing music. A short while after that, the South Bend Race began I am not sure where the start was, but Eddy Street was closed with the racers passing by the apartment. 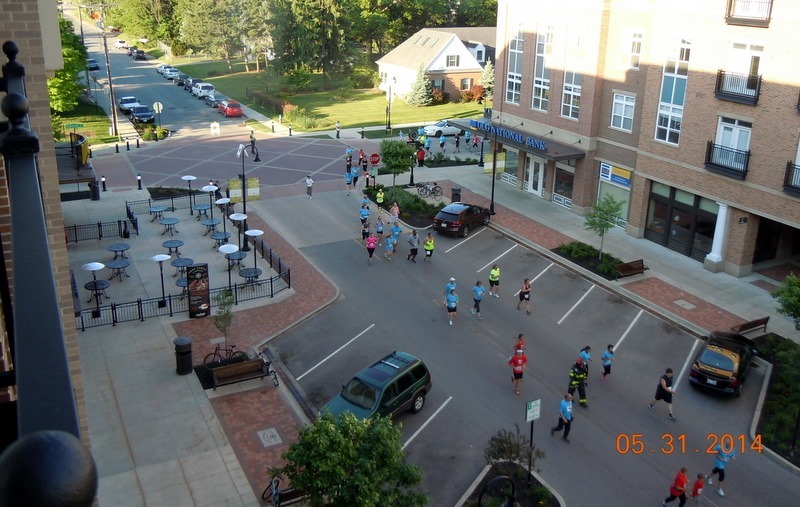 We kept the door open, as the weather was nice, and watched the racers/walkers. Note the arrow pointing to the band. At 8:30, we ran to the Farmers Market to pick up some items. There are 3 entrances to the parking garage, so we had no problem exiting and entering. The only problem was with all the streets which were closed for the race. The race ended on the Notre Dame campus. The band packed up and left around 10 AM. 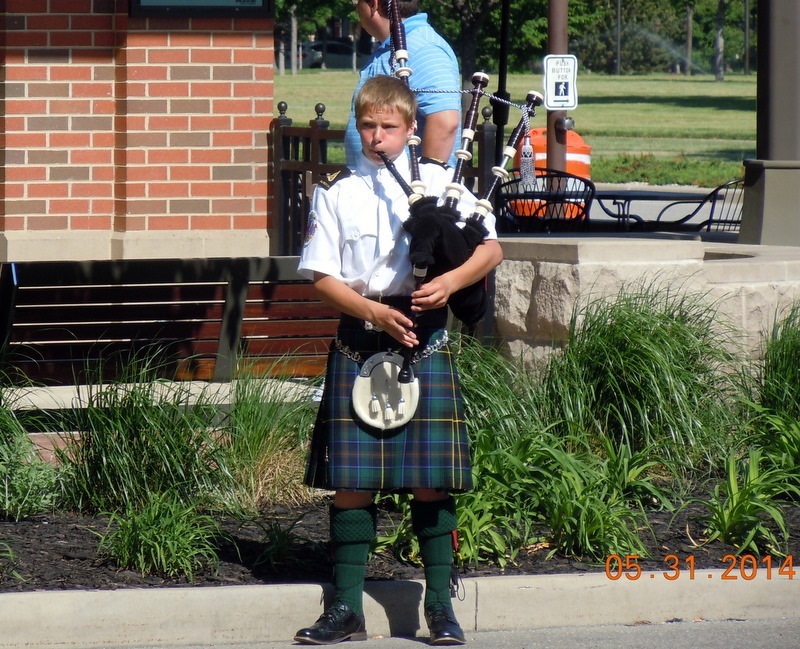 At that point, we could hear a Bagpipe. Since the sound was in the distance, it sounded pretty good. So I went thru the north building to see if I could find the musician. What a surprise, it was this young kid, who was very good! He was standing on the corner in front of O’Rourke’s Restaurant. We ate very lightly today. It was so nice out, that in the afternoon, we took the dogs to Leeper Park, which is right on the St. Joseph River, in the middle of town. We watched “Saving Mr. Banks”, which was fun. At least Disney did not ‘re-make’ Mary Poppins, they did a movie about the making of the movie! Sunday- Bob retired four years ago today and we started our travels. Neither of us can believe we have been living in the MH and traveling for four years! Wow, time sure flies. The only regret that we have is that we were not able to start our travels earlier! Both of us felt a lot better, but we still took it easy. At 1PM, Blake and his girlfriend, Leslie, stopped by to pick up the rent check. When she walked in she gasped and said “ its so clean and smells so good’! We hung out talking for a bit, then they left. We ran over to the video store and picked up Season 1, disc 1 of Game of Thrones, which we watched. Monday- Both of us seem to be back to normal. I went to PT. On Friday, Chris had decided that I need an MRI. He thinks I may have a tear, not of the rotator cuff, of other ligaments. So he had contacted my MD in Westminster. He decided not to treat me and to wait for the results of the MRI. I returned home. We left and went grocery shopping. We returned and I tried calling my MD office, but the PA was not in today, and she is taking care of the pre-auth for the MRI. We ate lunch then went back to the video store. They did not have the next Game of Thrones disc, but the gal called the other store, and they had it packaged as a set. So we paid 1/2 price for the entire season at the other store. Good deal at $1.29. We returned home and Bob took a nap. I worked on some Genealogy. We watched Crossbones and then started on the second Game of Thrones DVD. We watched the two episodes on the DVD, then watched “Nebraska”. It kind of dragged a bit, but we did finally start laughing. It is supposed to be a comedy, but it took awhile to get to the funny parts. Tuesday- It was a very nice day today, but the Mormon South Bend Family History Center is only open on Tue and Sat. So at 1 PM we stopped by the video store and dropped off Nebraska and went to work on some Genealogy. Bob found a 65 page, well notated ‘book’ on the internet, through Ancestry.com which told him a lot of facts that he did not know. He was pretty excited when he found an ancestor, his great uncle John, who was a friend of Buffalo Bill Cody. 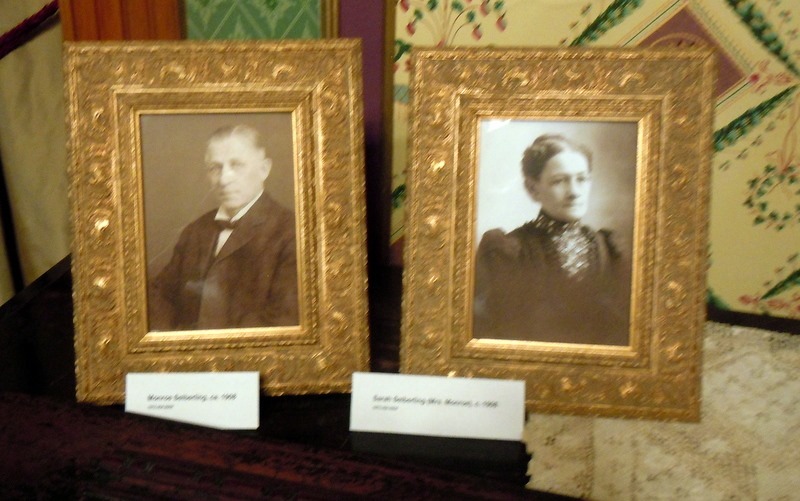 We might have to go back to Buffalo Bill’s museum to look for his ancestor! I found a lot of new information on my paternal grandmothers side. So we both had a great time! We left around 4 PM, and plan to go back to do more work. We returned home, ate dinner, and watched more Game of Thrones. Wednesday- It was going to be a rainy day, so we thought we would go to Kokomo IN to visit some of the museums. We left a around 9 AM and drove south on Hwy. 31 for 82 miles to Hwy. 35 for 5 miles into the town of Kokomo. The drive was very rainy with 18 wheelers thundering past us, throwing oceans of water at us! 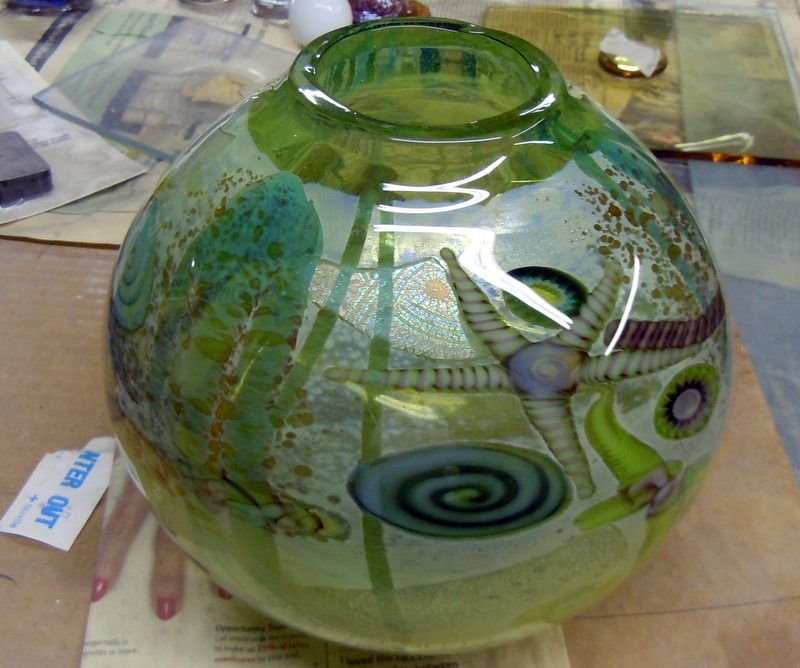 We went directly to KOG- Kokomo Opalescent Glass. Okay, who knew that Indiana was also a huge glass producer? There is even an Indian Glass Trail! 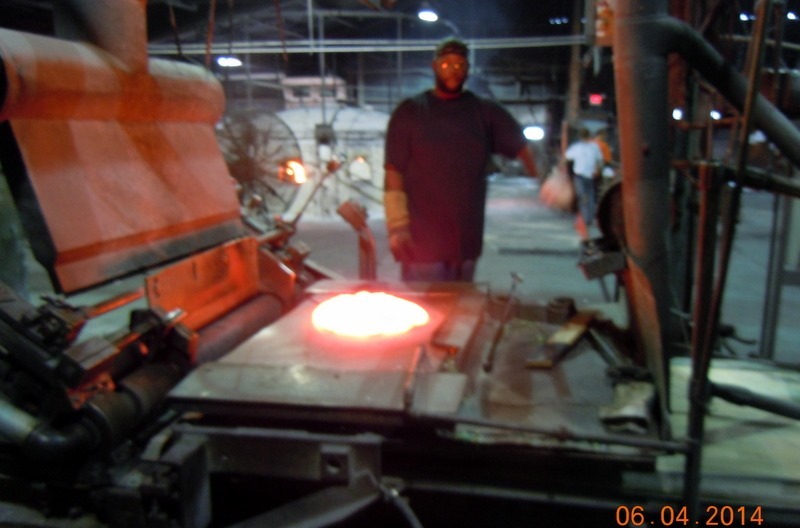 Natural Gas was discovered in Indiana in the 1880’s; natural gas is a perfect fuel source for producing glass. 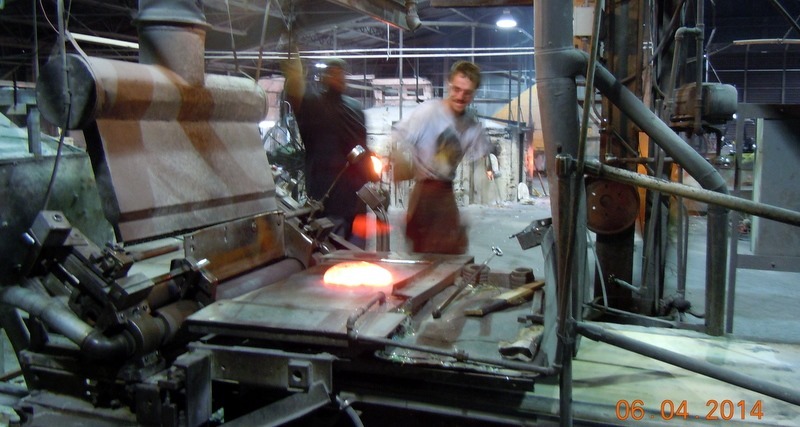 In 1886, east coast businessmen set up glass producing companies in Kokomo, since there were skilled workers and free natural gas was available. A glass chemist, Charles Edward Henry of New Rochelle, New York founded KOG. 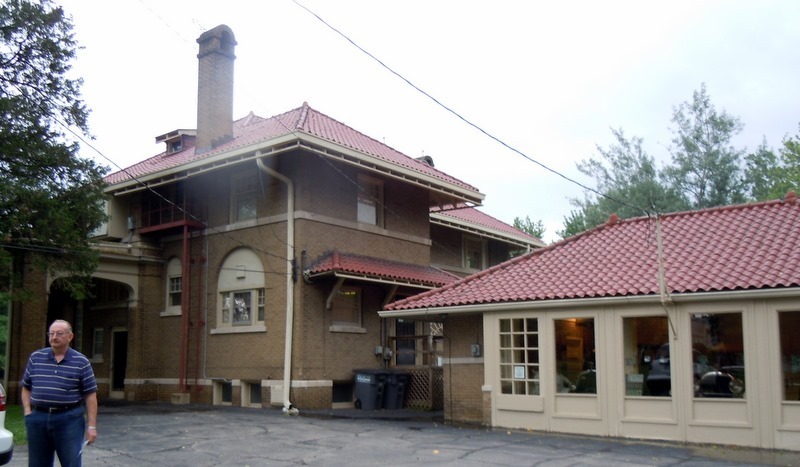 He built the original brick furnace hall and several of the outbuildings. 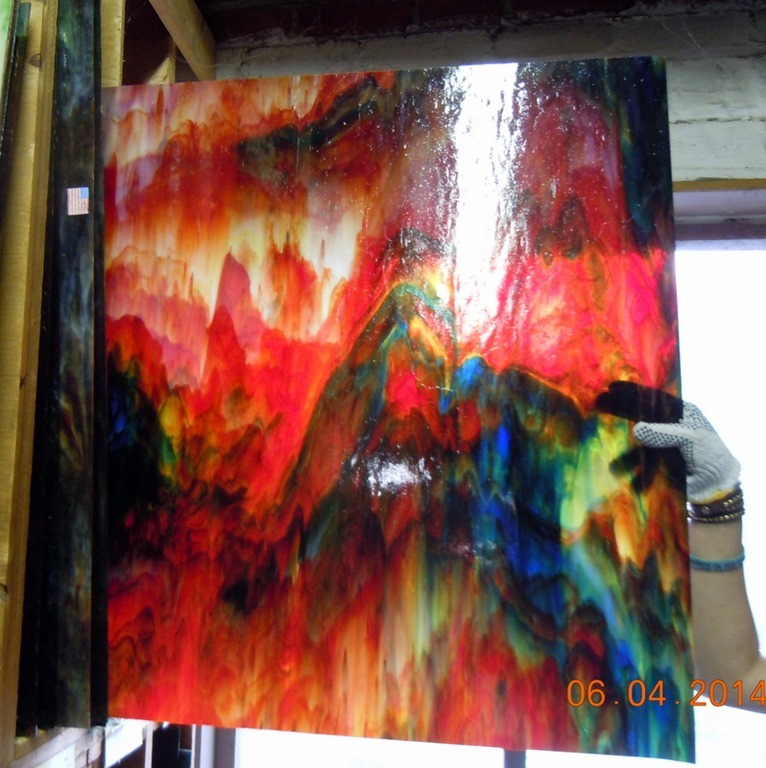 He began production of opalescent sheet glass products. He did quite well! Unfortunately, he was a poor businessman, spending all the money, including the money owed to the bank and the payroll. Within 16 months the company had been taken over by the bank. Three local businessmen, P.E Hoss, J.W.Lerner and .E.Blacklidge purchased the business from the bank. At that time there was a lot of competition producing small items. 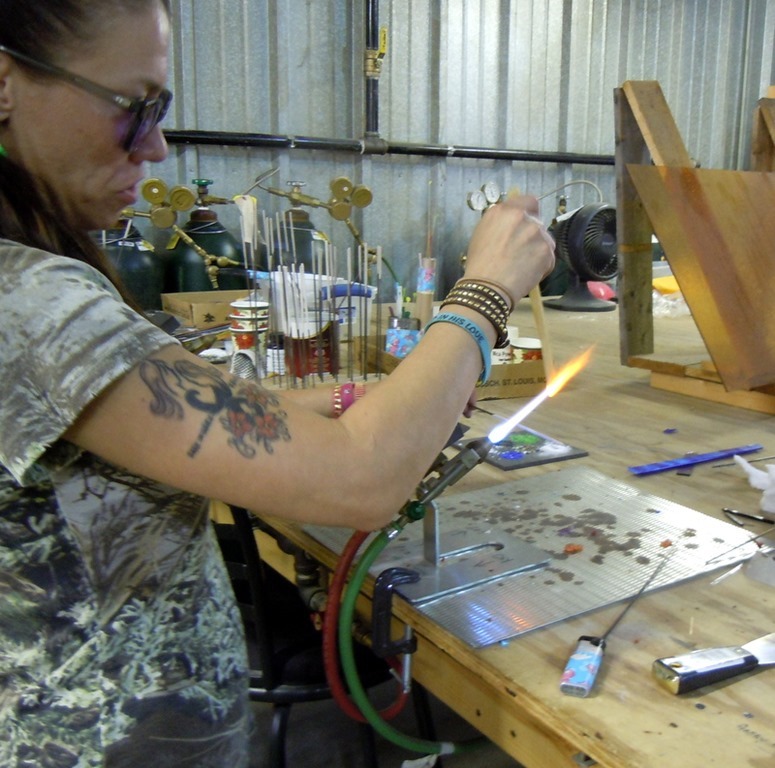 These entrepreneurs decided to focus on producing one-of-a-kind sheets of decorative art glass. 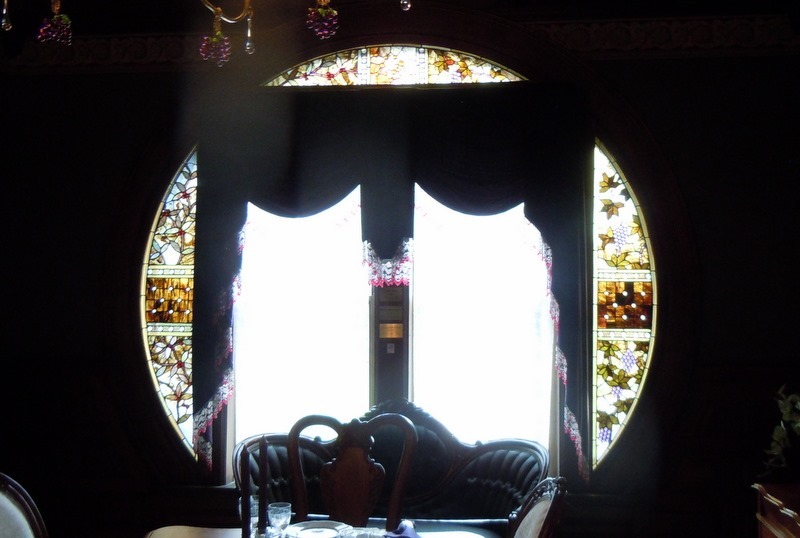 By the late 1890’s the company had Tiffany, LarFarge, McCully, and Miles as their clients. In 1898 the company was awarded the Gold Medal of Excellence at the World’s Fair in Paris. Unfortunately, the natural gas was free, so it was squandered. What should have lasted 50-60 years, only lasted 15. When the natural gas ran out, most of the glass companies went out of business. 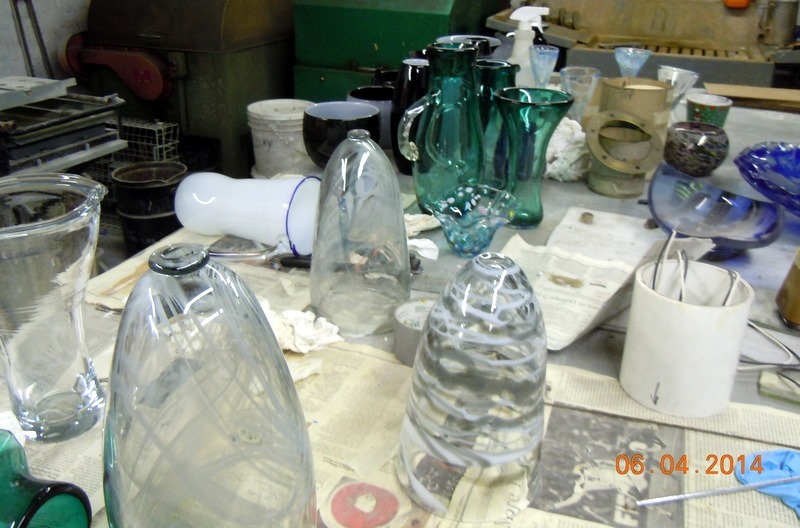 KOG is the oldest continuously operative manufacturer of decorative art glass products in North America. 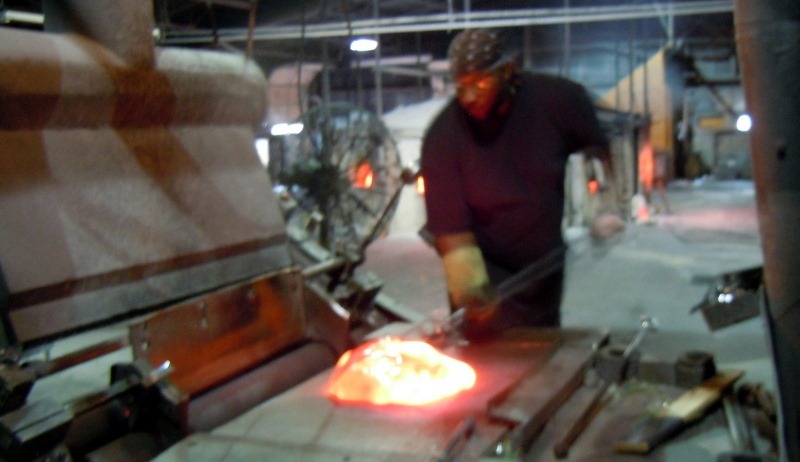 It is also one of only 5 companies in the US that produce glass, by hand, without automation! They are still producing glass for Tiffany. When China shut down factories for the Olympics, Armstrong needed a continuous source and came to KOG and has stayed with them producing a stronger glass with their(Armstrong’s) recipe. The shift begins at 5 AM and ends at 1 PM. 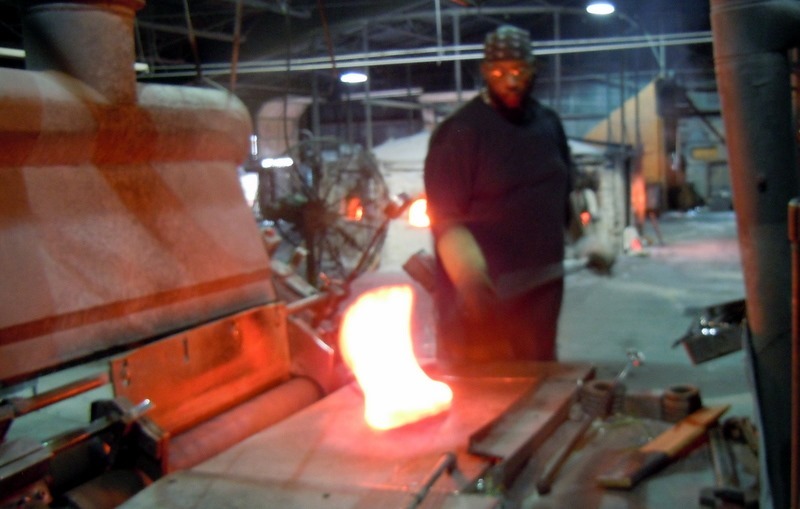 “At KOG, glassmaking begins each day with one man and a shovel. Twelve wagons with 12 batches have been prepared for the furnace man with the aid of a tiny chemist’s balance scale and an old recipe book with faded italic script; after all it is 122 years old. On the factory floor the 2500 degree fiery furnace roars, twelve pots inside, fueled by a center flame, portals ready to be fed. 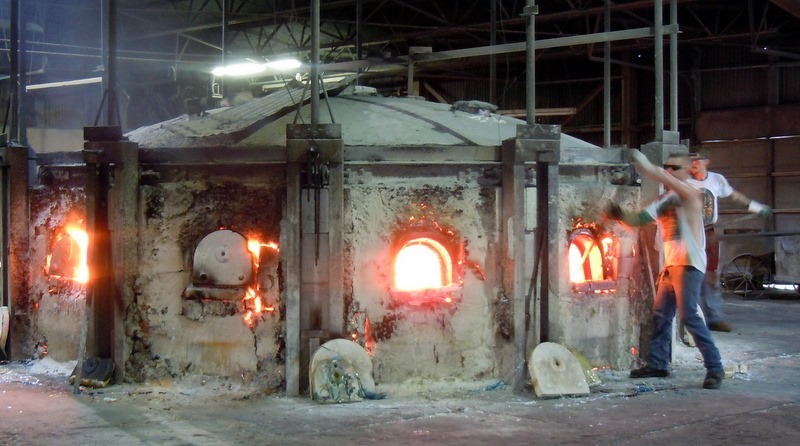 In eighteen hours the 1000-1200 pound mixes of sand, soda, and pigment will transform into molten lave…glass. 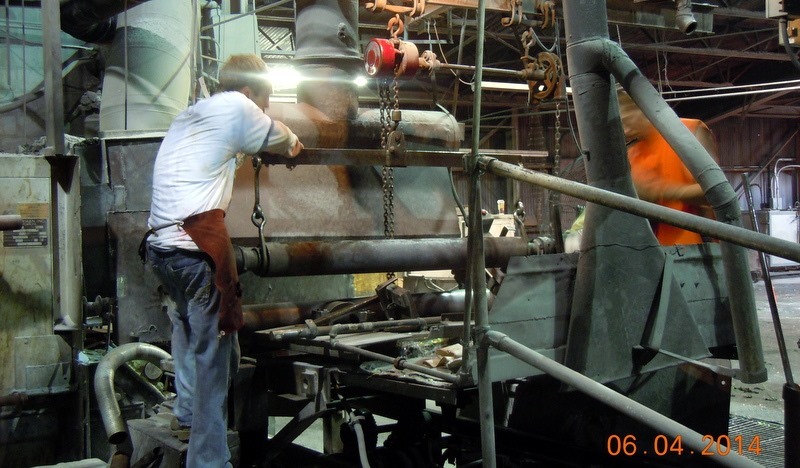 “ The twelve pot furnace is considered to be one of the historic company’s main strengths. It allows for greater exibility and creativity with color and scheduling. With over 300 recipes for a single cathedral colors alone, and over 500 documented color combinations, KOG can combine formulae for more or less density and a variety of textures to achieve practically infinite possibilities that can be delivered…The color choices requested by Tiffany and others from the early 1900’s remain in the product line alongside new formulae developed for recent contemporary applications”. 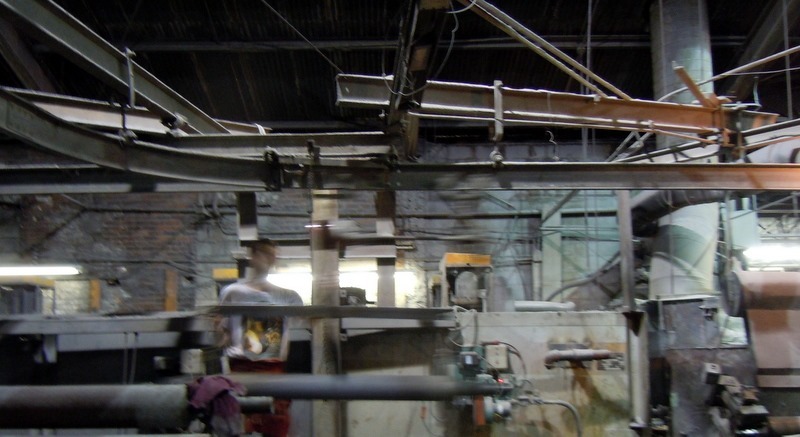 “Beginning at 6 AM, sheet glass ladlers stand ready. Every minute and a half a bell rings, signaling the men to dip their ladles and gather the glass for the hustled parade to the mixing table. There the mix man, a highly experienced craftsman, lifts the 45- 50 lb. gather with a two-pronged fork, draping and stirring, intuitively feeling the right mix. 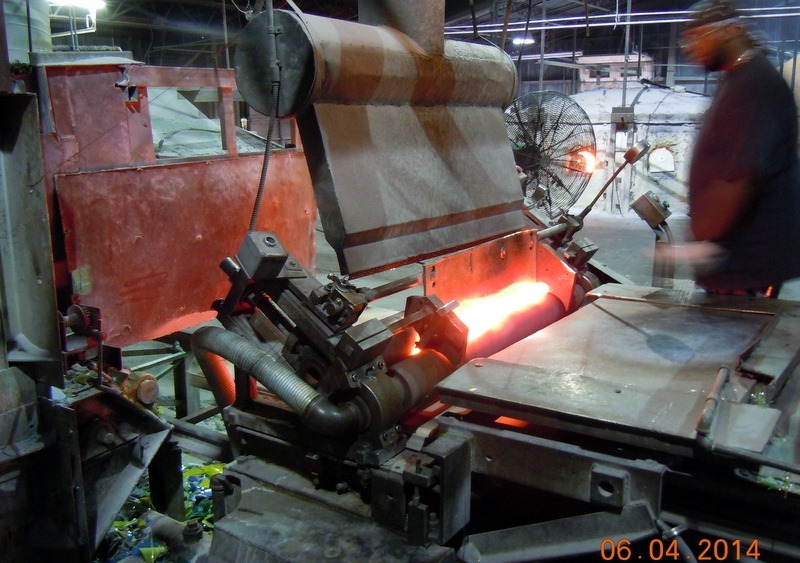 “The extrusion, now a glowing sheet of glass, measuring 96”x35”, is caught by the slowly moving large steel plate and delivered to the mouth of the annealing lehr. Beginning to cool to its natural color, the sheet is gently pushed onto the conveyor belt for the hour long journey through the temperature controlled chambers of the lehr.” Above taken from the KOG brochure, with many thanks. The pictures are mine. We were able to watch the workers change the rollers on the table. This is one of the rollers. The roller moves across the gantry crane during the changing. Below is a picture of the antique Tiffany table. The Tiffney glass is slightly thicker than the other glasses produced. 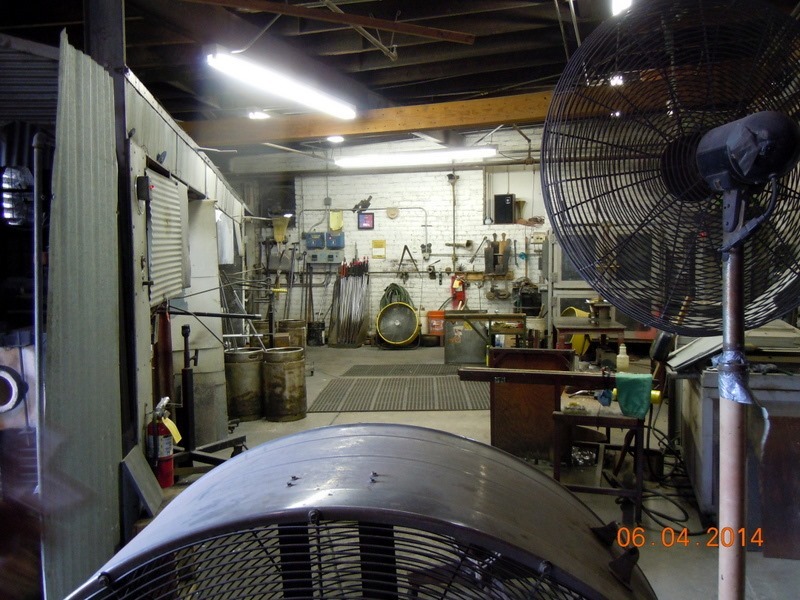 We moved on to the glass blowing room, where unfortunately, the workers were on break. 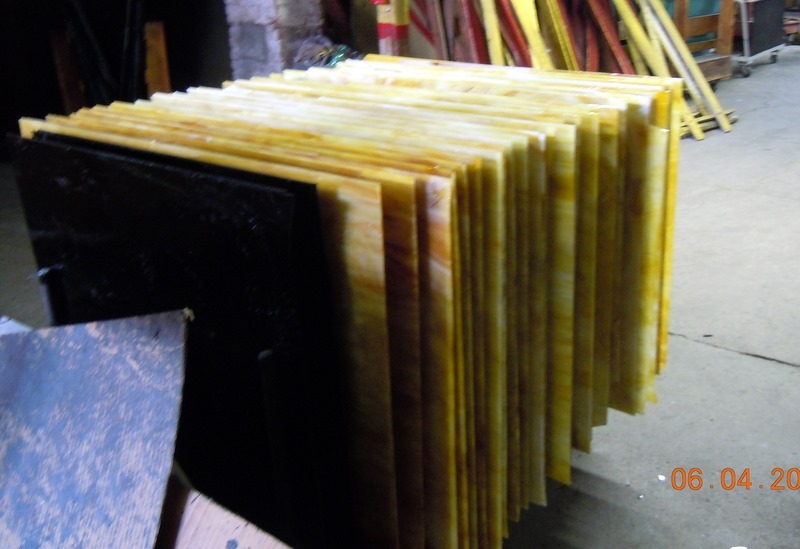 In the late 1990’s, the company decided to make use of the many barrels of left over glass trimmed from the sheets of glass. They decided that they could use this glass in a hot glass studio. They have become one of the primary producers of American made rondels which are used to create bowls, vases, paperweights etc. Above is a vase with the rondels. they are small pieces of glass, which are placed into the item, then through various processes, become part of the item, in this case, the starfish or shell. This takes a lot of skill, artistry, and imagination! Above is the end of the lehr, where the workers cut the cooled glass. Glass then continues to cool. 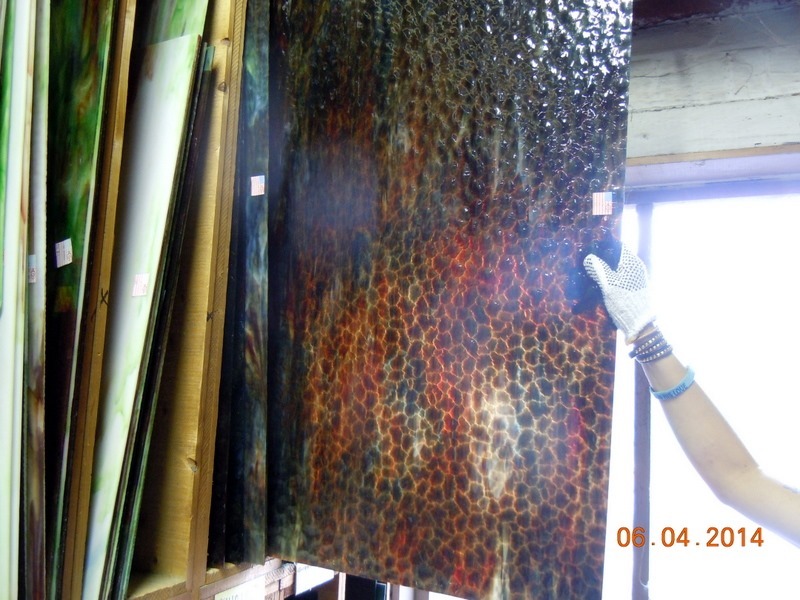 The flat side of the glass can touch another flat side, but the textured side cools at a different rate, so textured glass has to stand up to cool in these racks. The company packs the orders in these crates. Because 40% of their product goes overseas, they need to add these wood shavings to the crate. Overseas laws are different and items cannot be shipped with ‘peanuts” or ‘bubble wrap”. The company has a very low breakage percentage. The crate is packaged with the wood shavings on the bottom, then a piece of glass, then paper, then another piece of glass until the top of the box, were more wood shavings are placed. Below, glass is stored, upright in this area. Our guide told us that when it is really quiet, you can hear the glass contracting and expanding. Also, the glass sometimes just spontaneously breaks, for no reason! We went into the oldest part of the plant. 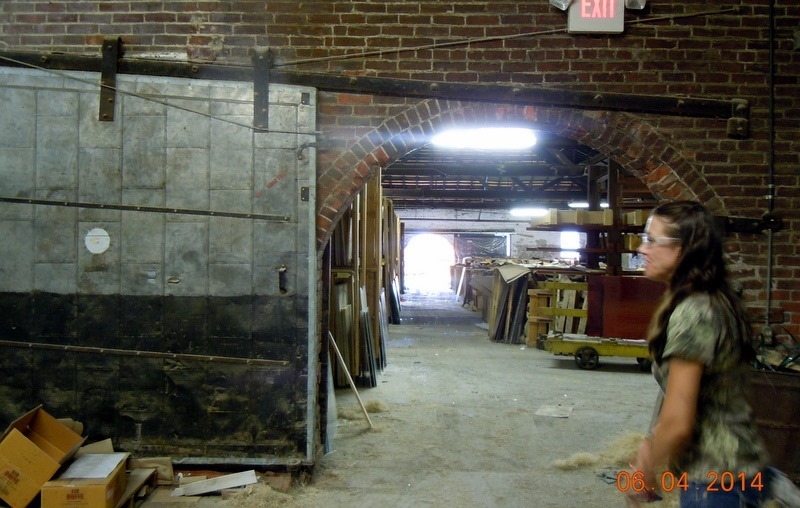 Below is the door which separates the oldest and the newer areas. 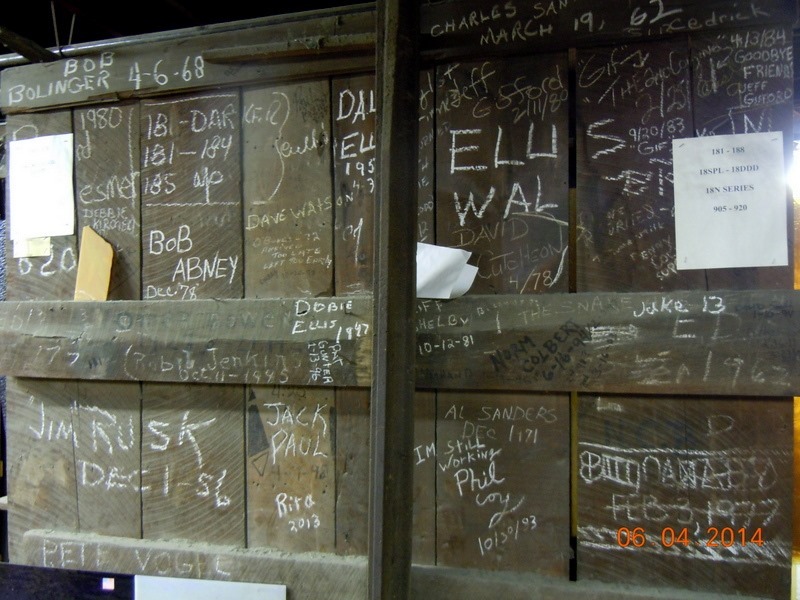 It is a custom for the employees to write their names and dates of employment on the walls. 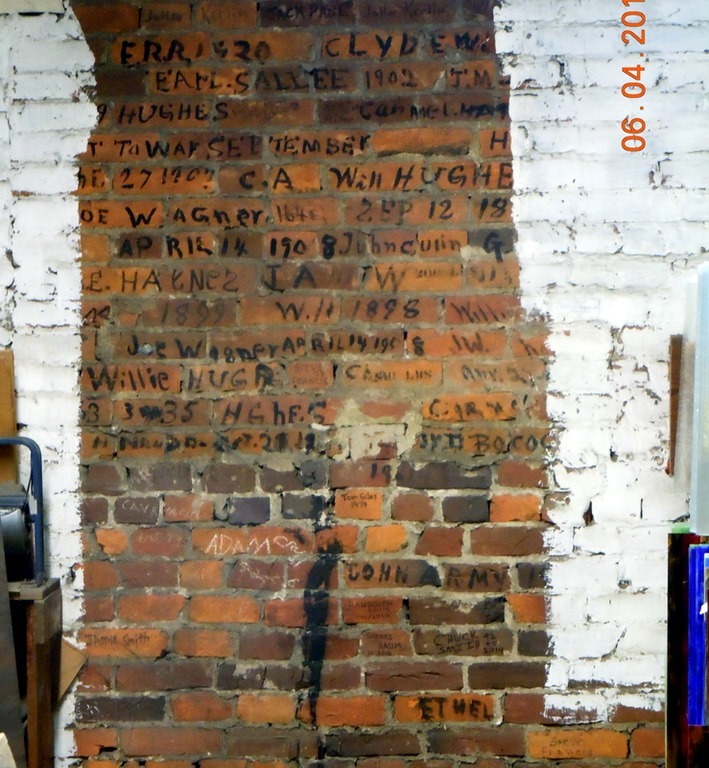 Some of the walls have been painted over with white, but here is some of the left over names and dates. 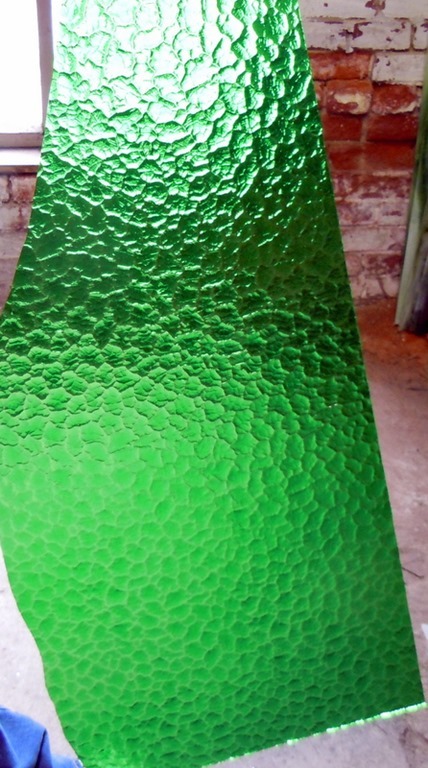 Below are some panels of glass. We had to wear glasses ( no problem we both wear them) but our guide had to wear both glasses and gloves. She only wore the gloves when touching the glass. OUr guide was also a third generation worker at the plant. Her grandmother worked here and her mother also currently works here. 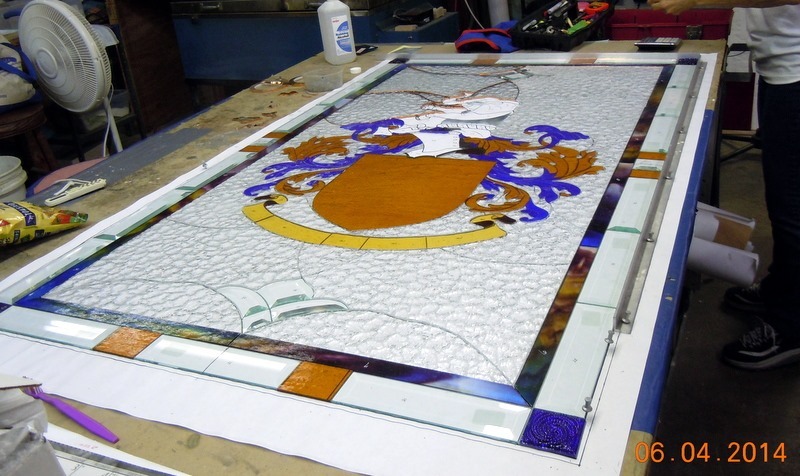 In the next area, one of the ladies was making a special order stain glass library window using a family Coat of Arms. You can see how it is coming together! 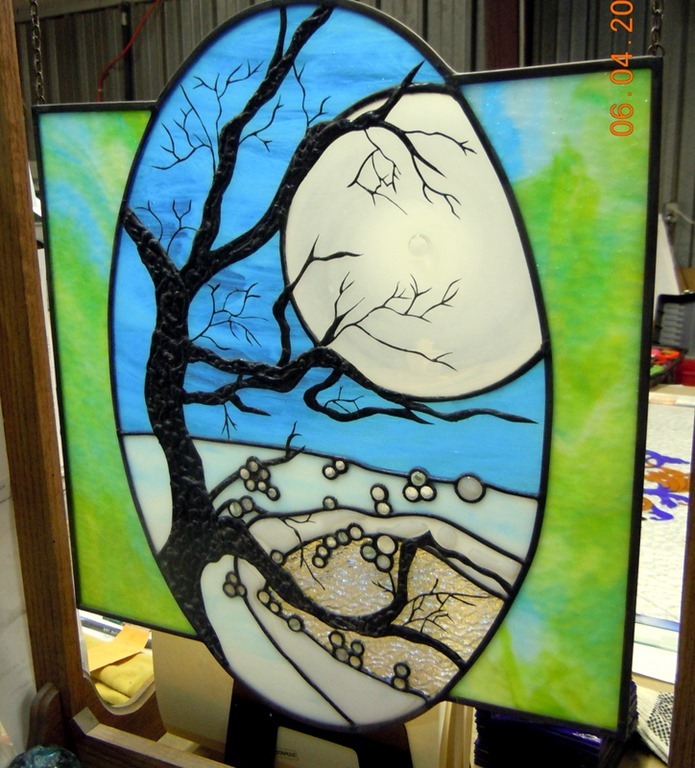 Below is a stain glass art piece that this same gal had created and is at the end of her work table. Our next stop was the bead making station. 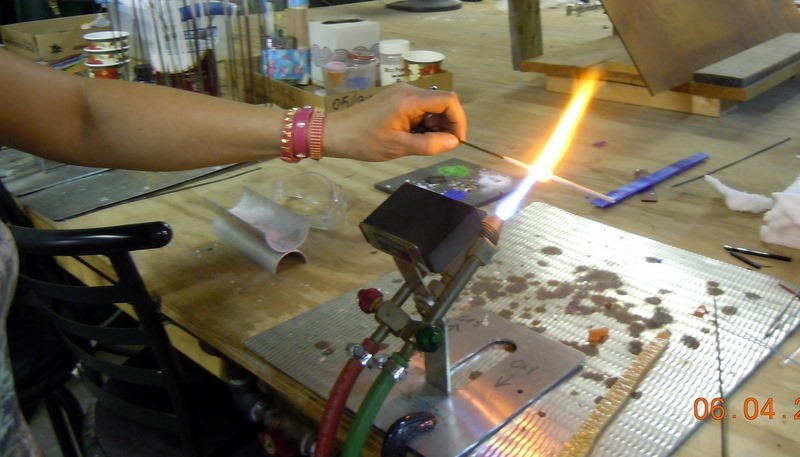 KOG offers some classes in glass making and bead making. 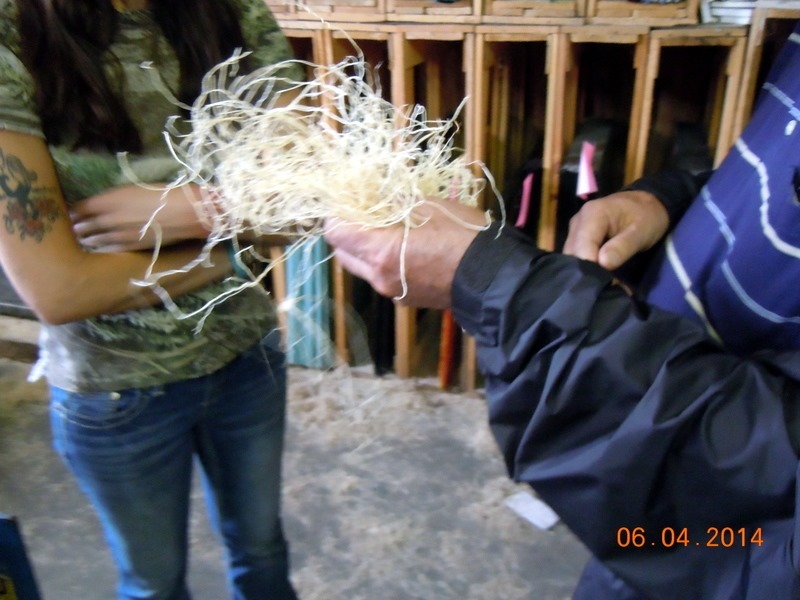 Our guide demonstrated making a bead. First she added the glass mix to the pole. Then she heated it. 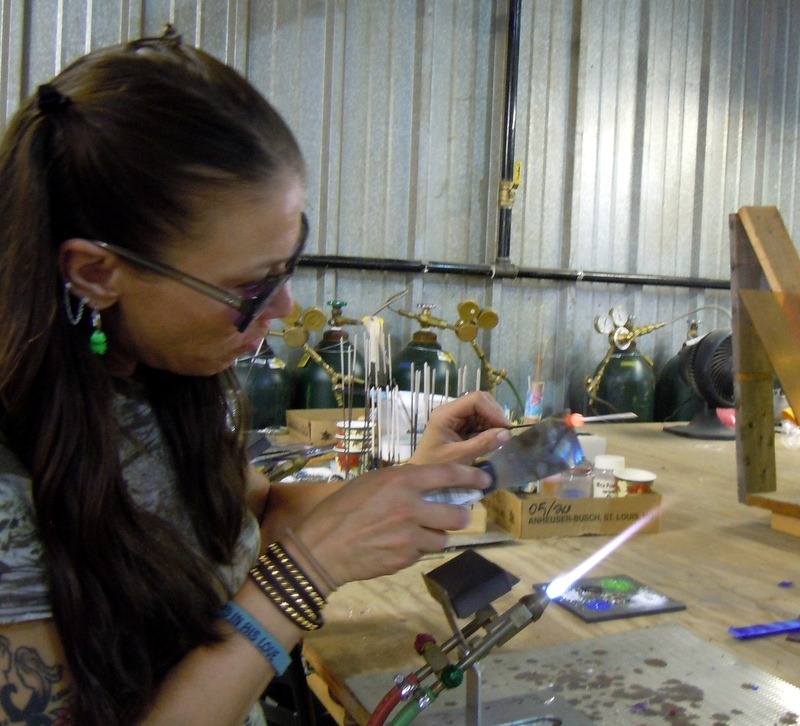 She added some particles to make the design, while slowly turning the bead, away from her so that the glass does not fly at her. 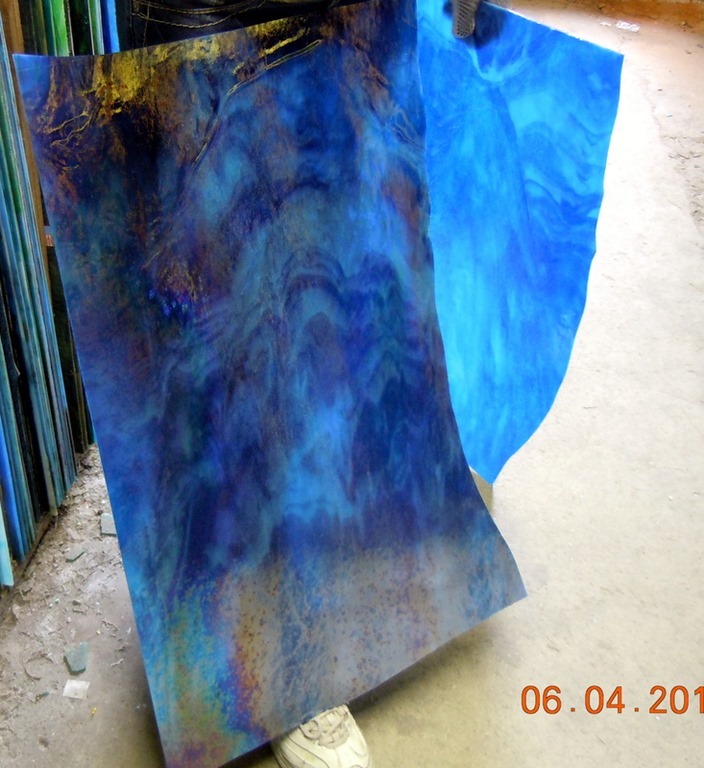 In the last two pictures, you can see the bead changing colors as it cools. 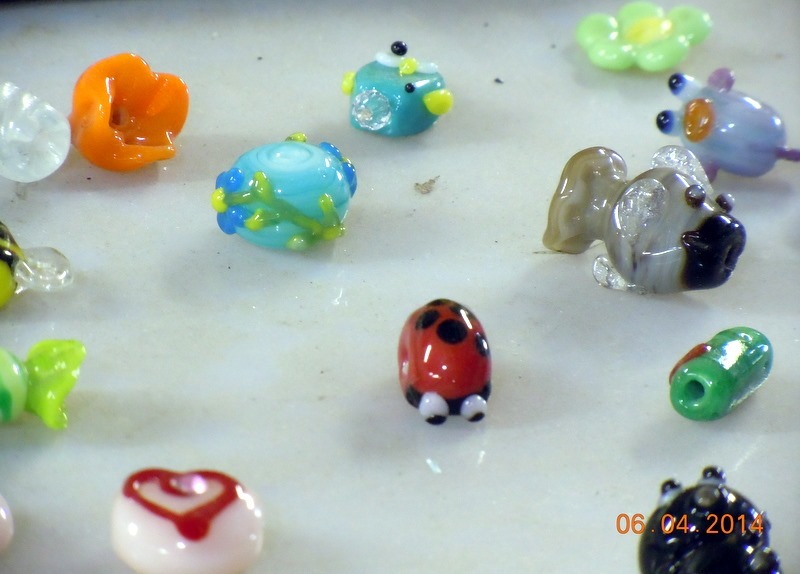 Below are some beads that have been completed. I really liked the little lady bug! 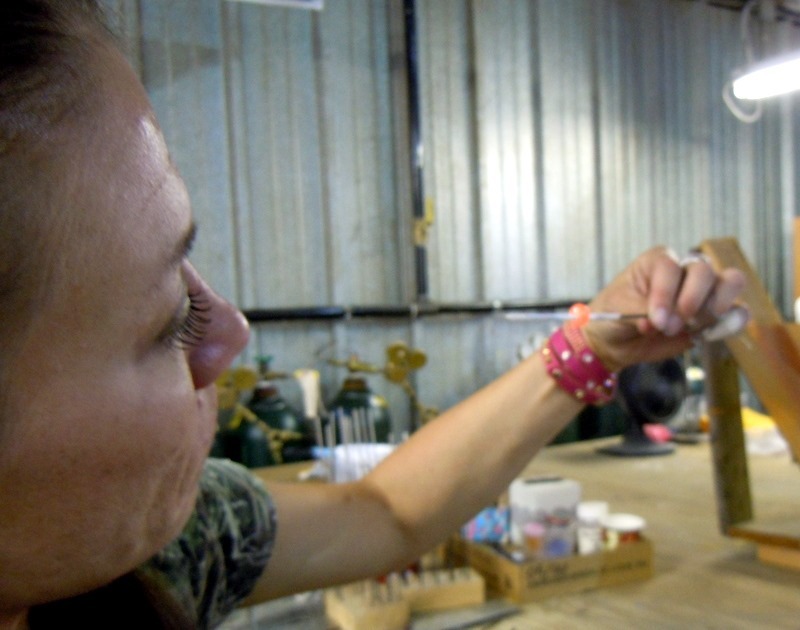 Our next stop was to watch a gentleman as he was creating a dog. And finally, we watched the glass cutter cut some glass. 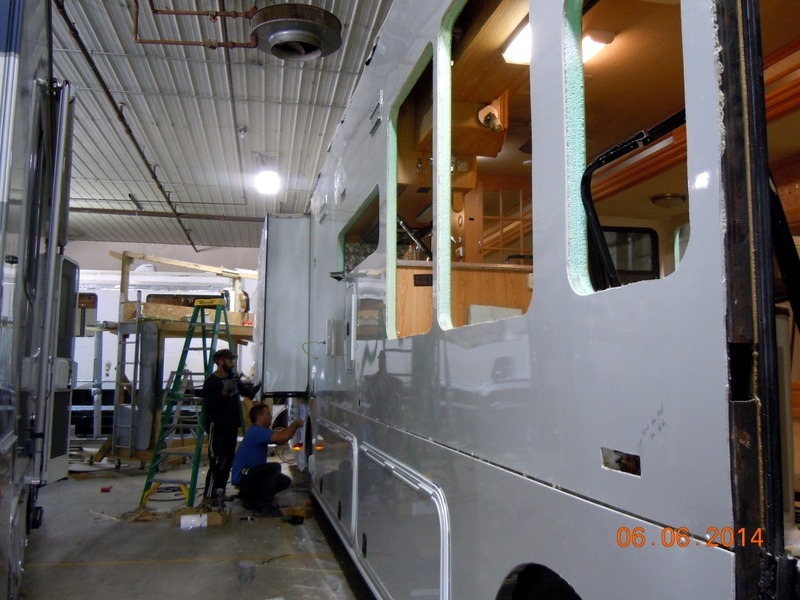 While we were talking to the glass cutter, another worker walked up to ask us about full time RV’ing. Her husband had been stationed in Indian Head and she lived in Waldorf, while working in downtown DC! Small world!! 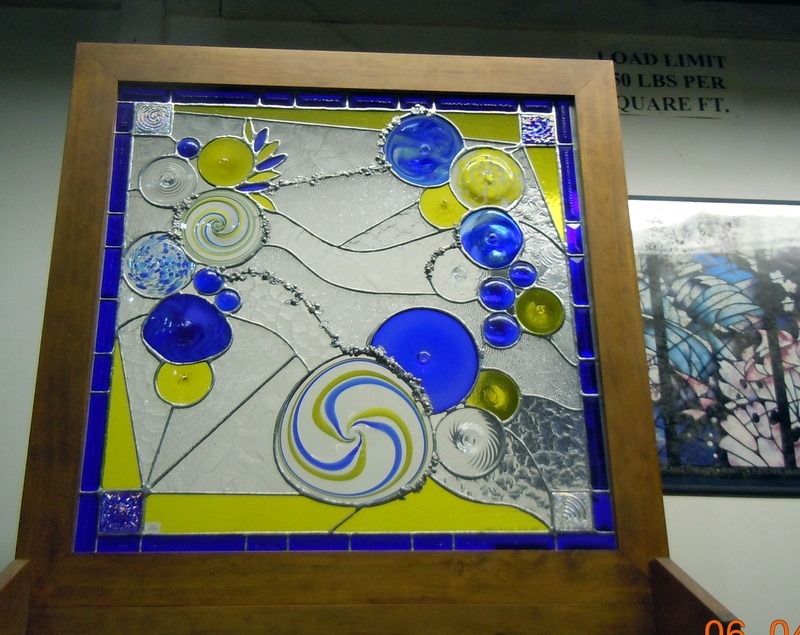 Here are two other glass displays. The gift shop was full of beautiful items. 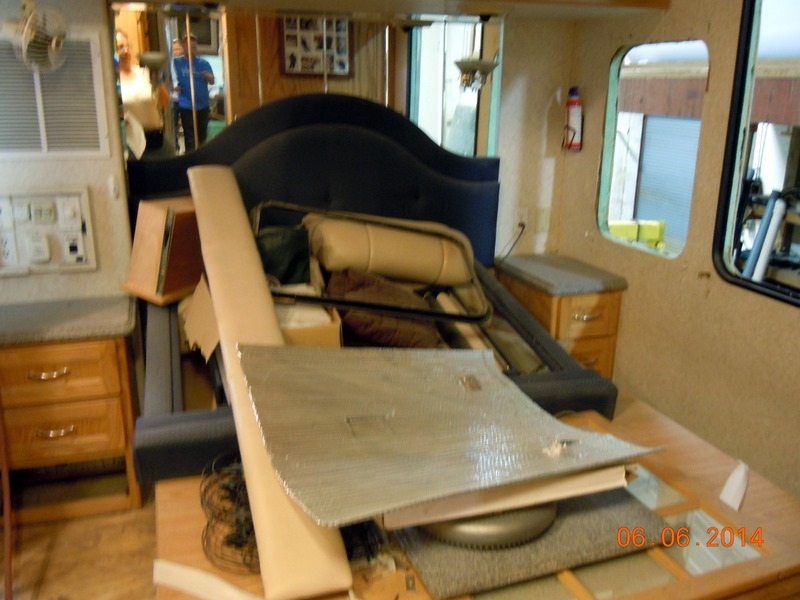 Good thing we live in a motor home, as we cannot have glass, or I would have been bringing a lot of items home with me! We after the 1.5 hour tour, and went to lunch at Half Moon brewery. Bob had a Cole Porter, which he liked. It was about 1:15 when we left there. 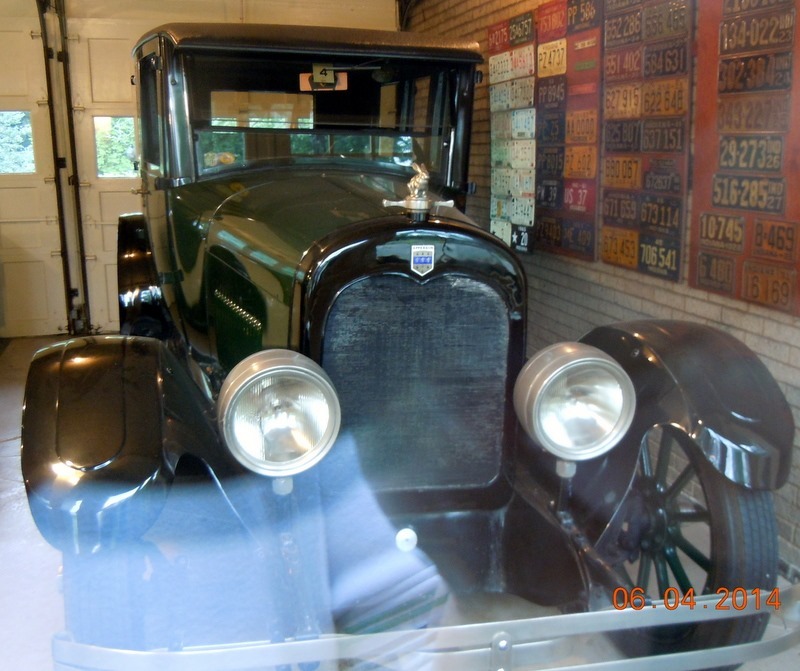 We proceeded to the Elwood Haynes Museum and back to automobiles! Neither of us had heard of Elwood Haynes before, but what an interesting gentleman. “At age 15, in 1872, Haynes invented an apparatus for making brass and succeeded in melting brass, cast iron and high carbon steel in his blower-furnace. He entered Worcester Polytechnic Institute in Massachusetts in 1878 and graduated three years later…entered Johns Hopkins for post graduate work in chemistry, biology, and German. He became interested in the Natural Gas Industry when it was in its infancy….He was appointed manager of the Portland IN Natural Gas Company. During this time he invented a small thermostat to regulate heat in homes. In 1890, Mr. Haynes was appointed field superintendent of t he Indiana Natural Gas Co. of Chicago IL, with headquarters in Greentown Indiana. While serving in this capacity, he discovered how to dry gas by refrigeration in order to prevent pipeline freezing. This not only evaporated the water but also reduced lower-boiling constituents to gasoline. Since there was no known market for this gasoline, it was dumped and allowed to evaporate. 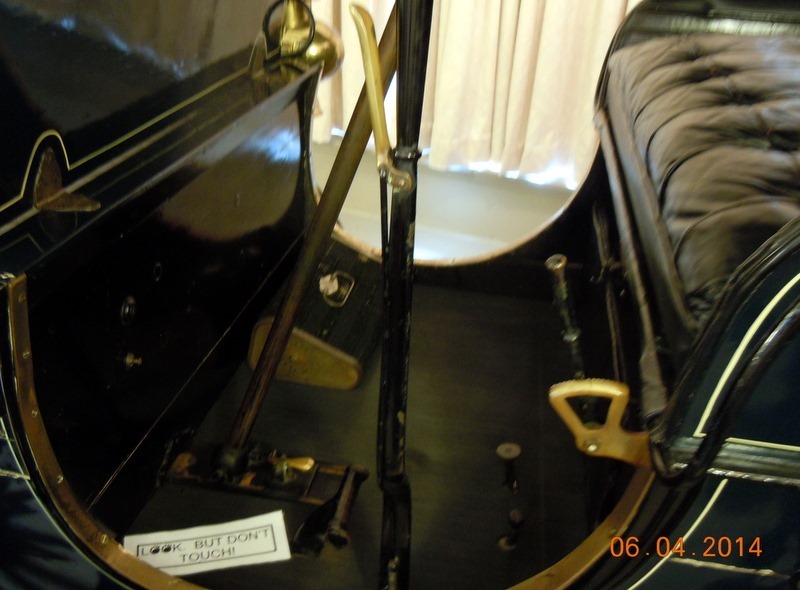 Determined to find some use for it, Mr. Haynes conceived the idea of a ‘horseless carriage’ in 1891 and began preparing drawings for its construction. In 1892, Mr. Haynes moved to Kokomo and in November, 1893 bought a one-horse-power upright two–cycle engine that used gasoline for fuel. A few months later, he hired Elmer and Edgar Apperson for 40 cents an hour to build this contraption in their Kokomo Machine Shop. 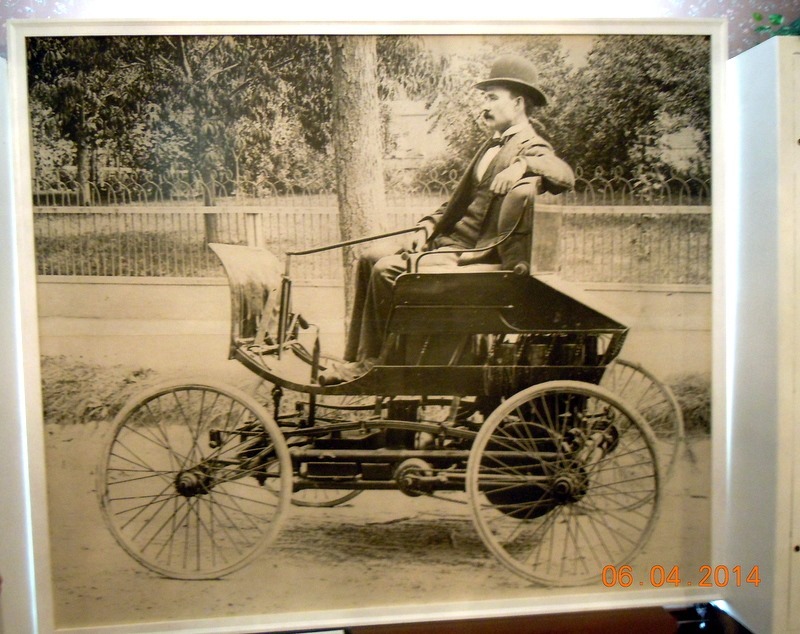 On July 4, 1894 Haynes had the first trial run in his new automobile….after being driven about six miles that day at six or seven miles per hour, the automobile was a success” making Elwood Haynes the inventor of the first automobile! 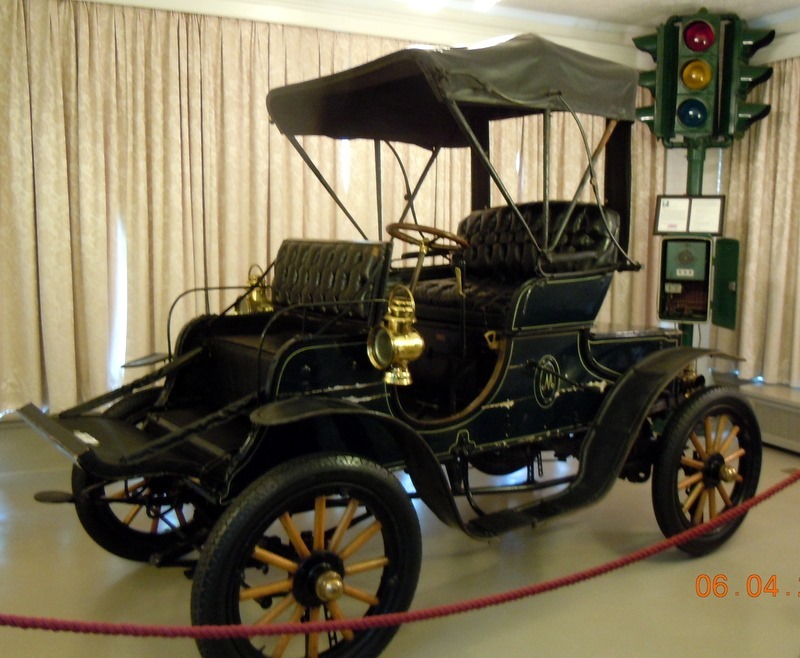 He refused to sell this first auto and in 1910 gave it to the Smithsonian. 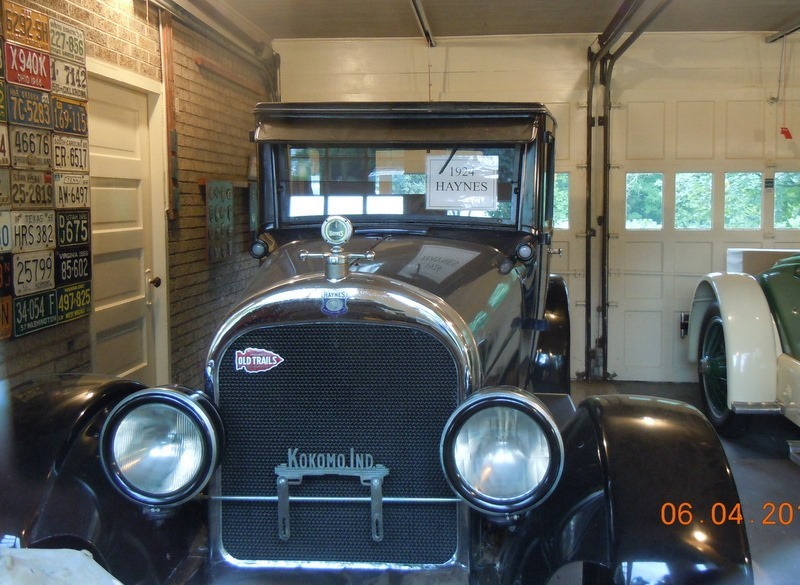 He drove this first car three miles east outside the city of Kokomo. 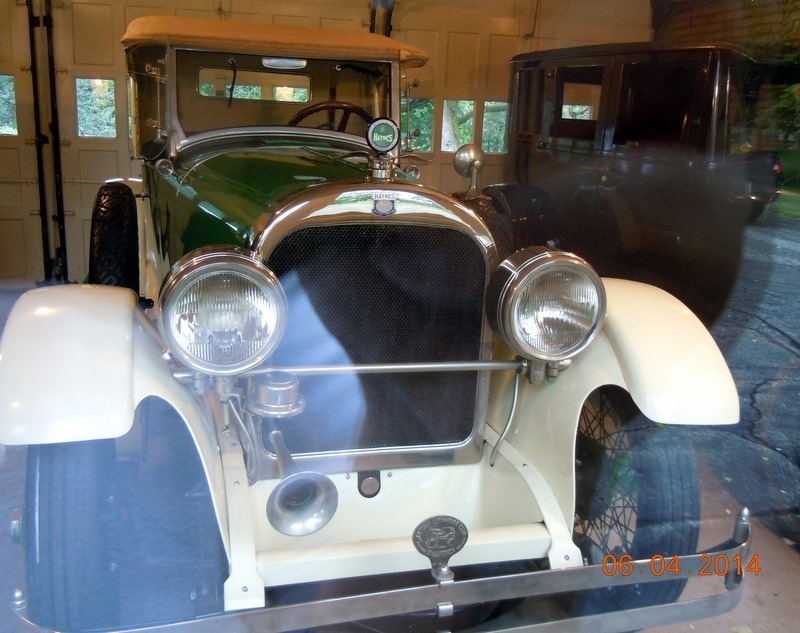 He also discovered how to form an alloy of pure chromium and pure nickel creating a sturdy frame and reliable engine.He was the first man to recognize the value of stainless steel and to make stainless steel. 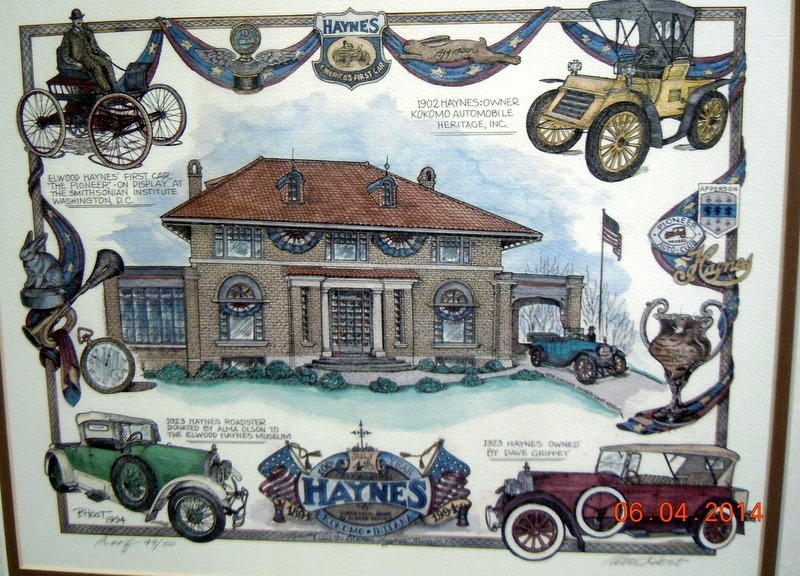 He and the Apperson brothers formed a partnership in 1898 starting the Haynes-Apperson Automobile Company. 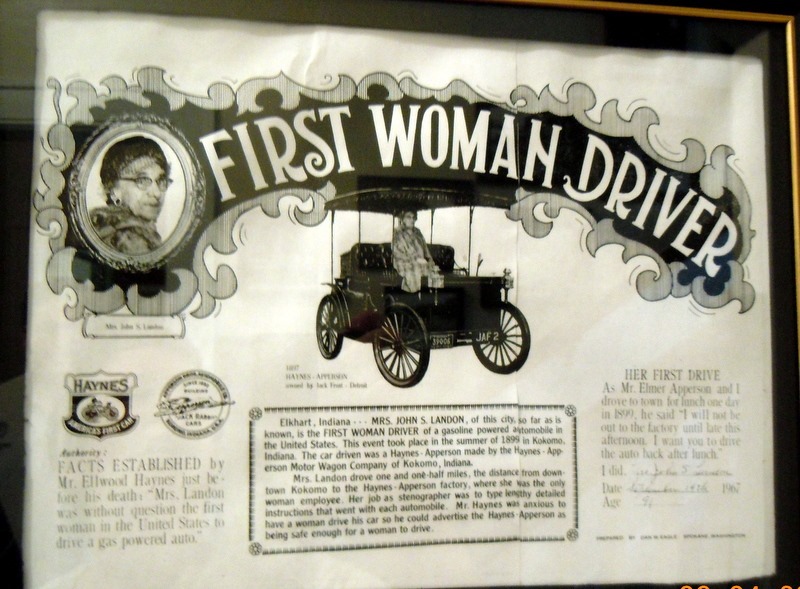 The company dissolved in 1902 with each forming their own automobile company. Haynes STELLITE alloys are still used today for blades in small turbines which power the fuel pumps in liquid-propelled missiles such as the Atlas rockets. His inventions helped the U.S. in both WWI and WWII. 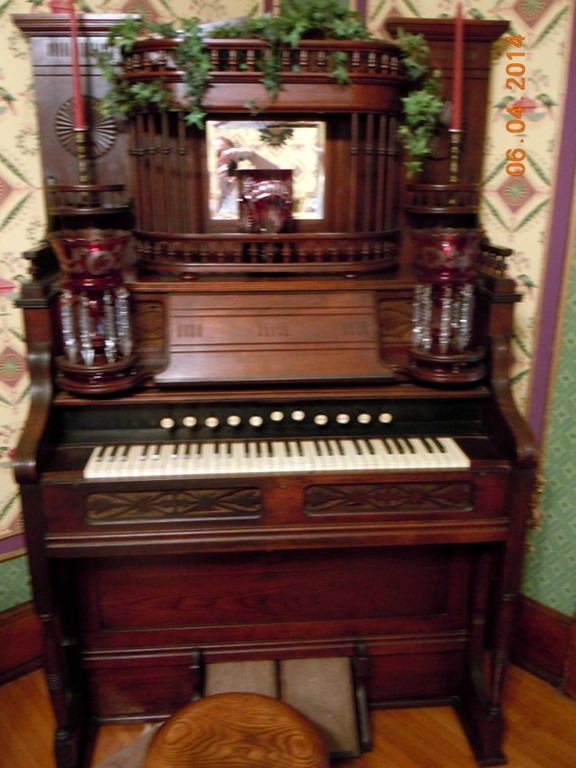 Below is the Haynes 1905 Model L, $1350.00. 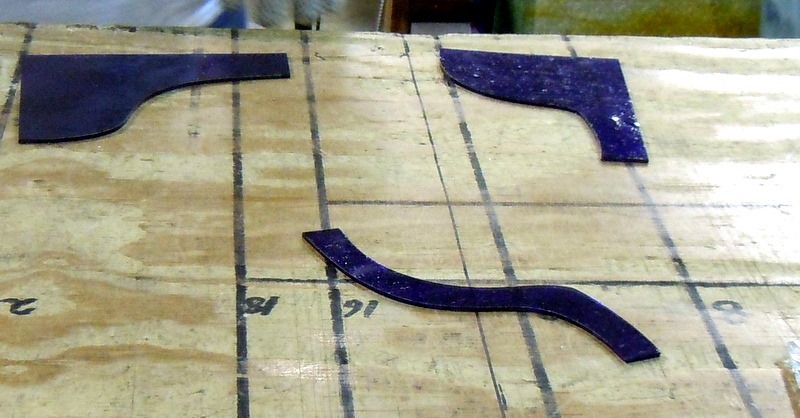 The accelerator and brake are on the floor. The driver used their heel to accelerate or brake. The house was nice, but not a real mansion compared to the next museum we visited. The house was donated by the Haynes grandchildren. There is very little original furniture. Upstairs there are some of the historical displays about the town. The museum is free, with donations encouraged. Here are three of the cars that are in the garage. I had to take the pictures through the window. 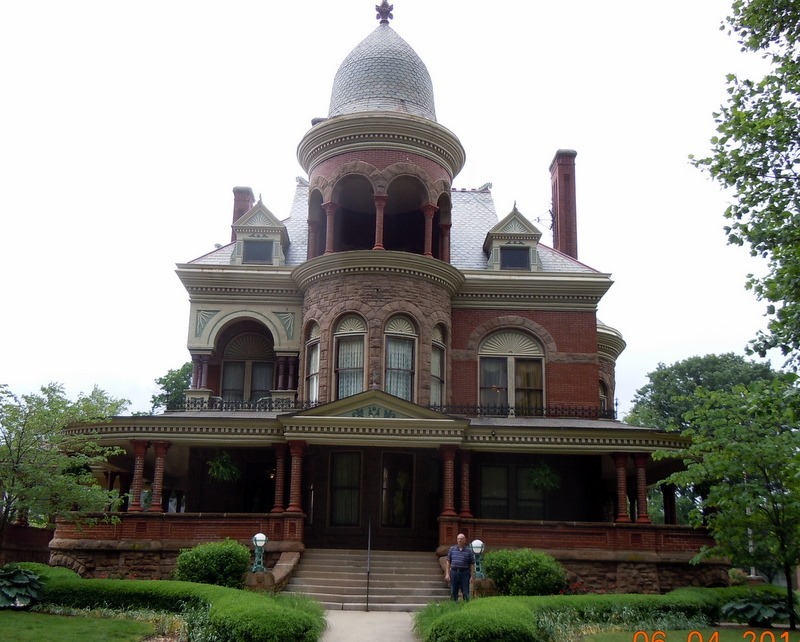 We left the Haynes Museum and went to the Seiberling Mansion. 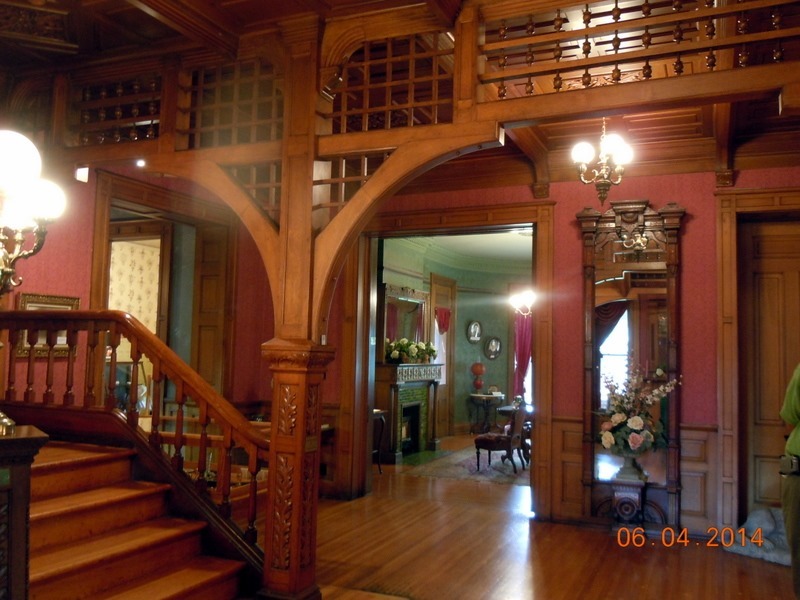 This mansion was built in 1891 by industrialist Monroe Seiberling. Entrance to the museum was $4 for seniors. 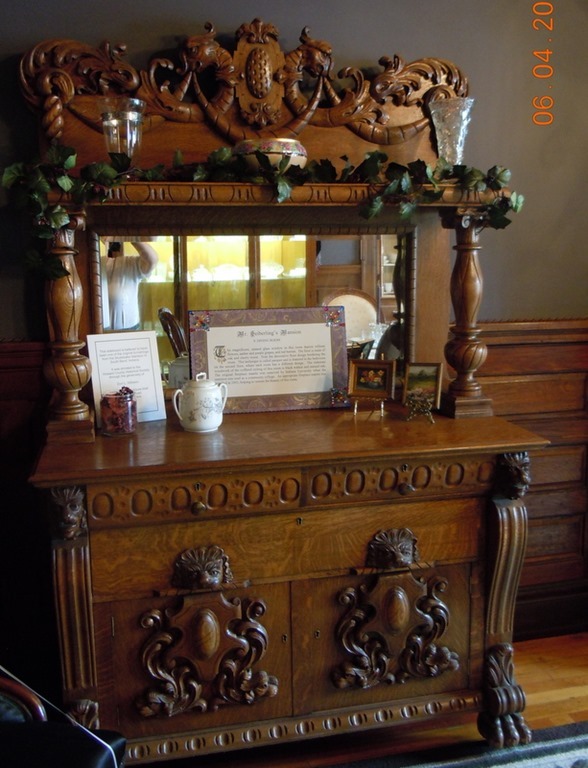 Again, the furniture is for the period, but not the original families’ pieces. The house is 11,000 sq. 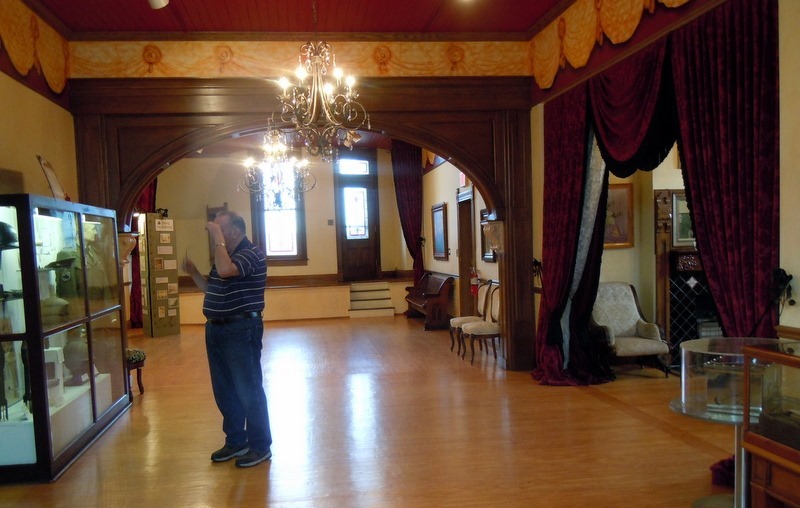 ft., which is the size of the other Seiberling’s Mansion’s carriage house in Cleveland! 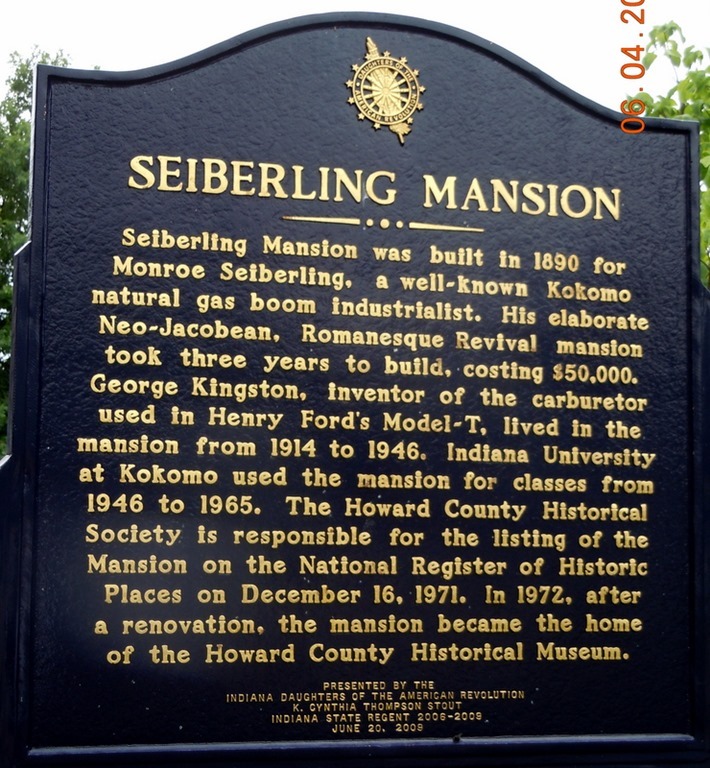 The Sieberling’s only lived in the home until the natural gas ran out. The house was then purchased by the Kington’s who lived in it until 1946, when it was purchased by the University of Indiana. It was used by the University until they outgrew the house. 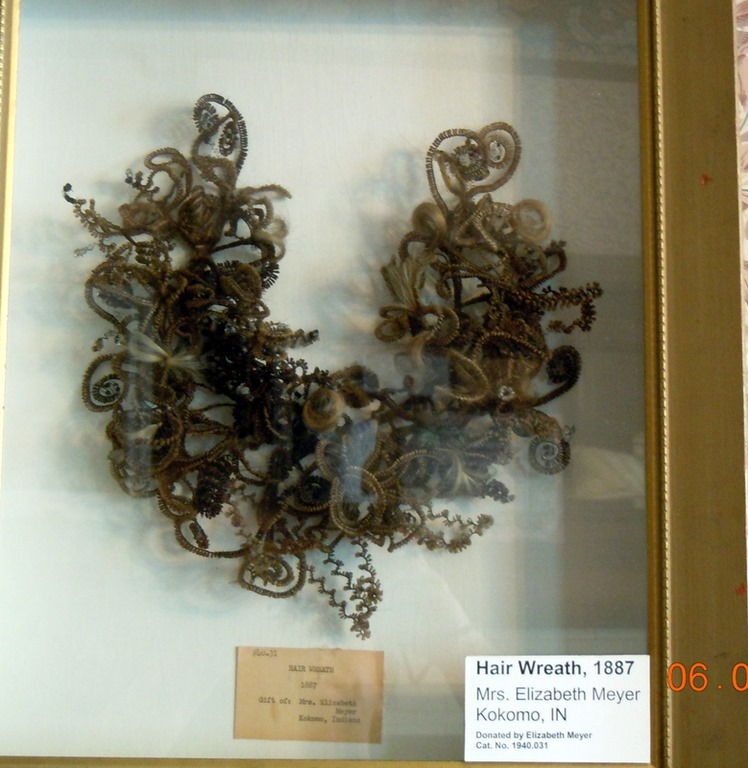 It then deteriorated until the historical society took it over. There is the story of an older gentleman volunteer who meticulously put together the puzzle of broken pieces around the fireplaces. He uses toothpicks to hold the pieces in place while he re-grouted the tile. 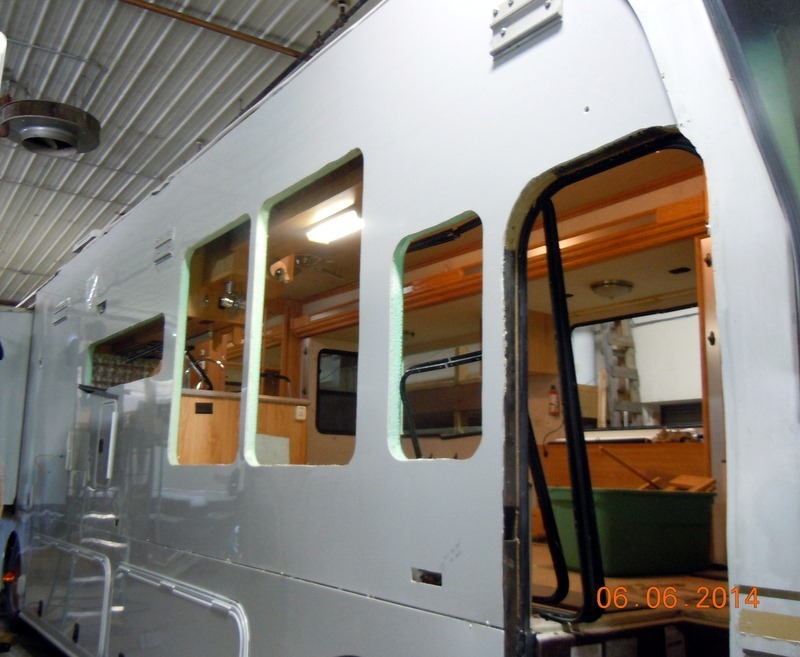 Here are some of the inside pictures. Below is the entrance way. Above are the Seiberlings. 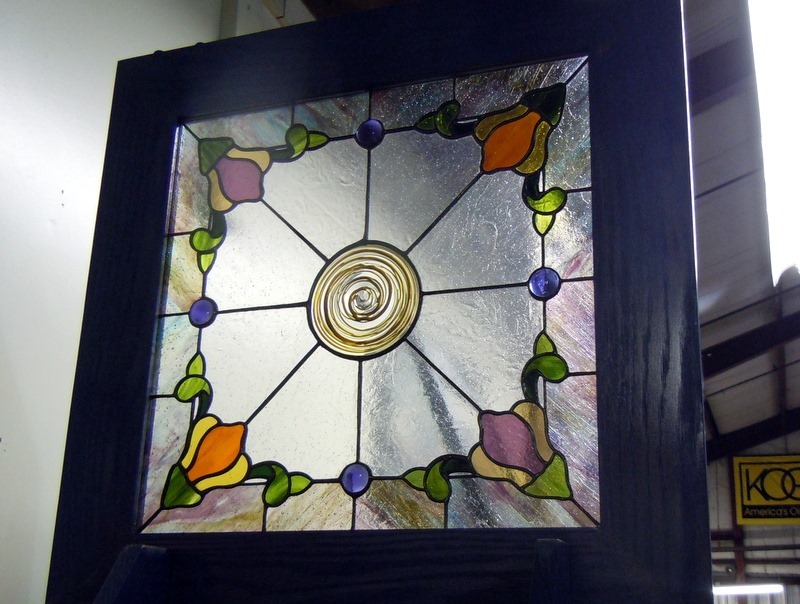 Below is the dining room stain glass window. The bathrooms and the kitchen have been re-done as very modern for use during events. 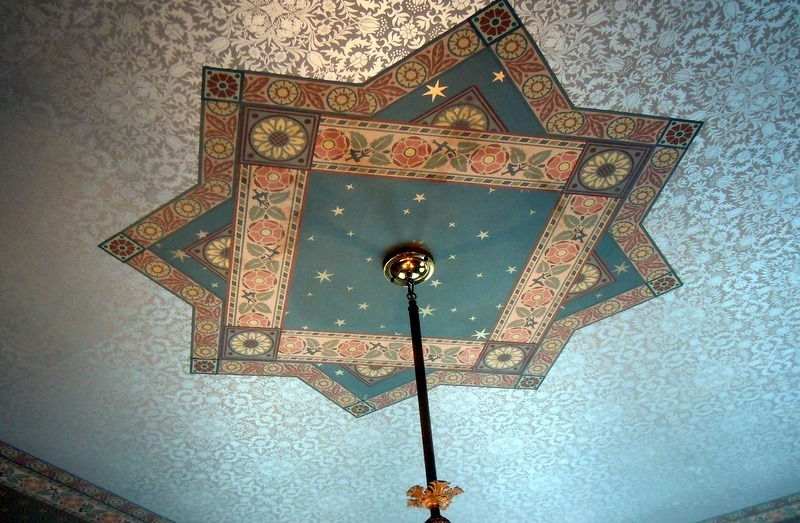 Below is the ceiling in the round tower in the front of the house. 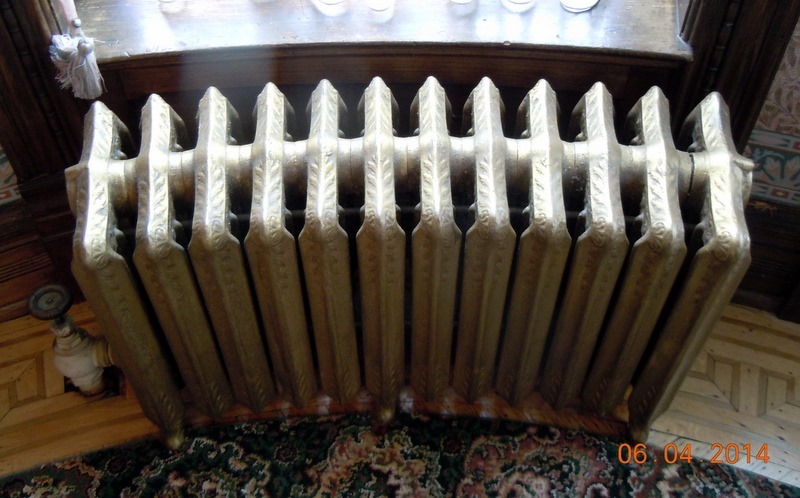 Below is a rounded radiator in that room also. No mansion from this period was complete without a ballroom. This room was on the third floor. 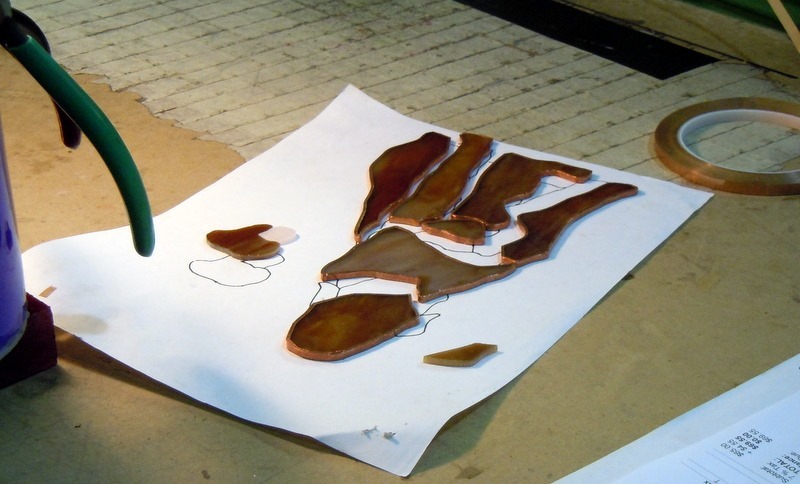 It is currently displaying pieces from each of the country’s wars. The Kingston’s, who lived in the house after the Seiberlings, allowed their children to roller skate up here. Mr. KIngston invented the roller skates we used as kids, the ones with the key I was always losing! The building had a lot of displays about the city and county. 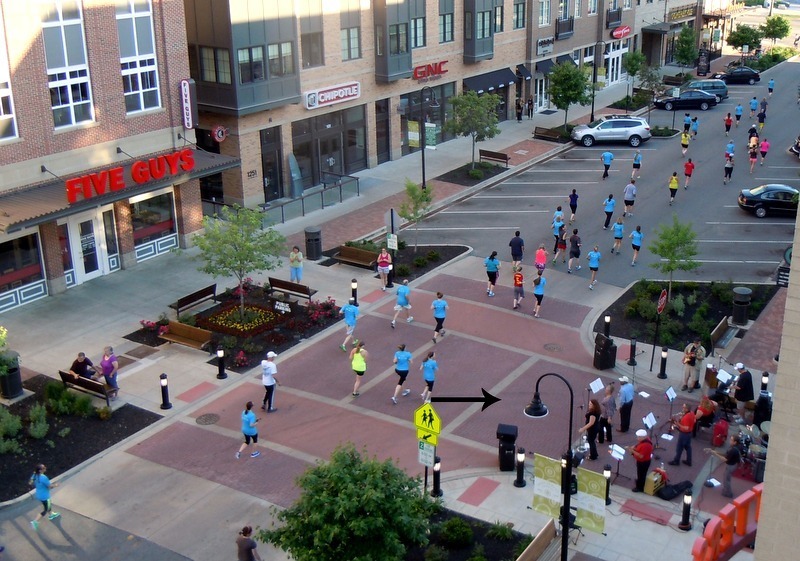 Kokomo is quite the City of Firsts! By this time it was almost 4 PM, so we drove the 87 miles back to South Bend. We ate dinner, and watched more Game of Thrones, completing season 1. Thursday- It was a beautiful, post rainy day, with bright blue skies, low humidity, and temps in the 70’s. We returned the Game of Thrones Season 1 disks back to Family Video, went to lunch at Prime Table in Niles MI. Prime Table was a nice choice. It is a Greek Diner, with really good food. We went to the Notre Dame bookstore. What an awesome place! We could have spent a lot of money on books there! Instead, I took pictures of the books I wanted and came home to buy one of them on Amazon, used, Readers Digest “The Most Scenic Drives in America”. We returned to the apartment, packed up the dogs and went to Howard Park. This park is also right on the river and was a very nice, busy park with lots of people and kids at the playground. We found an nice shady spot and hung out relaxing and enjoying the beautiful afternoon. 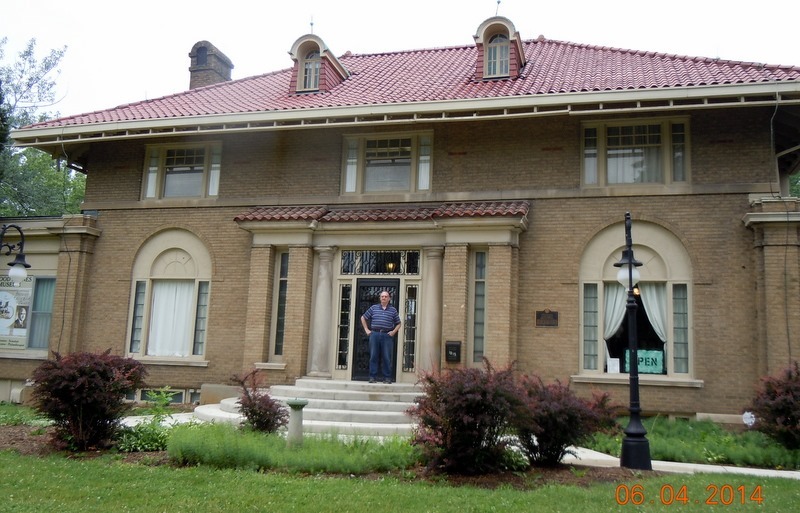 Friday- We left for Nappanee to visit the MH. Megan and PJ are not as far ahead as they had hoped to be. The drivers side of the MH is not completed yet, but the passenger side has been replaced. Megan was working on the floor. Here is what the bedroom looks like. Here is our new refrigerator. It is in, but not secured yet. The cabinet guy had been there earlier to do the design and quote for the cabinet underneath the refrigerator. Yes, it is a lot bigger!! It is also taller, so I am going to need a stool for the top shelves. 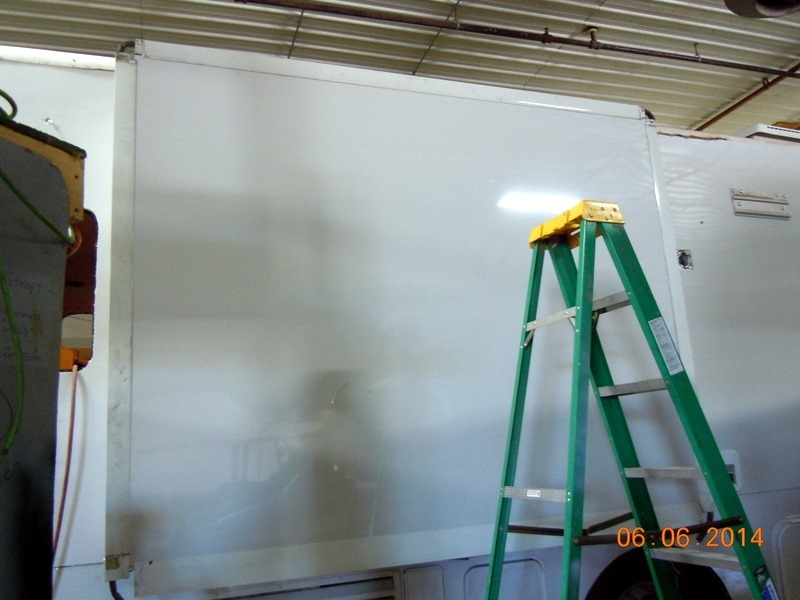 We cannot put it lower due to the electric panel underneath. I would have liked to move the electric panel, but the only place we can move it is over a heat vent and that would be a safety issue. Oh well…. We left McMillers and drove into Nappanee. We stopped at the Main Street café for a potty break and a snack. Outside is this apple sculpture. There are apples all over town and I kept missing taking pictures. 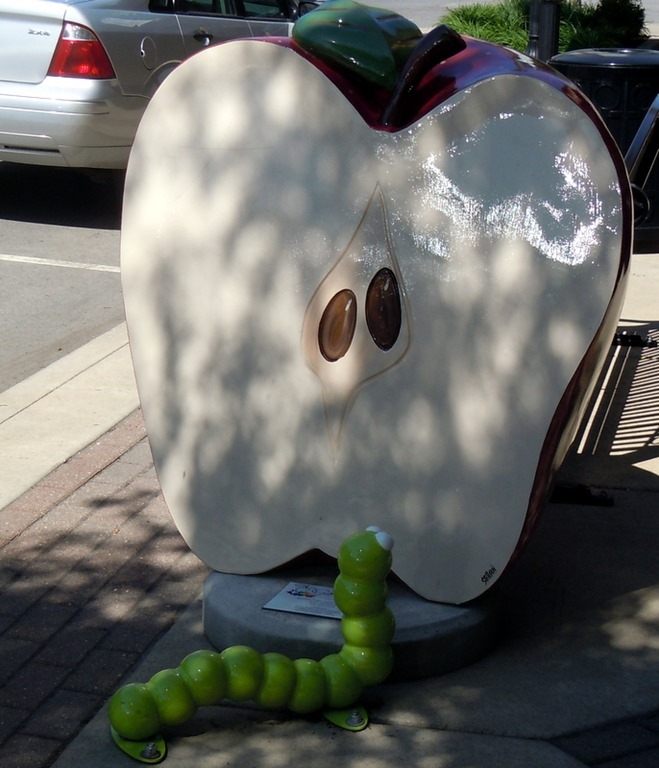 Nappanee has a big apple festival in the fall, hence the apple statues. We drove north on Hwy. 19 to Elkhart. 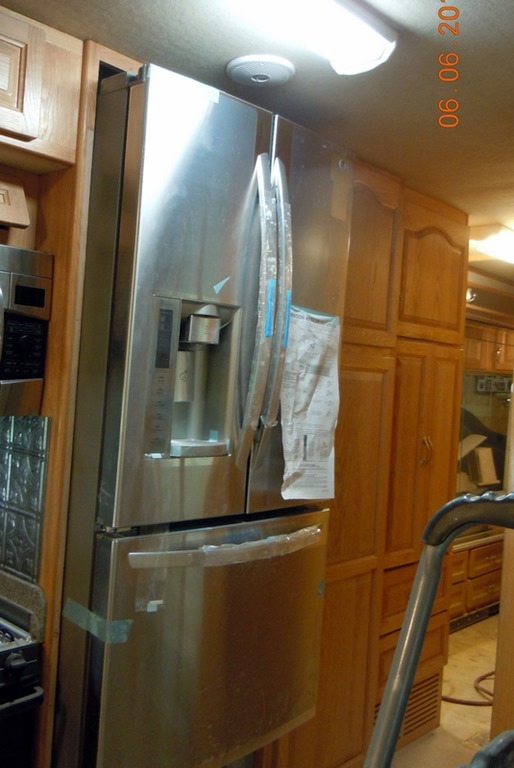 PJ suggested that we go to the RV surplus/used items stores and check to see if anyone wanted our used refrigerator. So we stopped at two stores. One, who only does new surplus said no. At the second one the manager was away. He will be in tomorrow. We turned onto the toll road and drove east to Shipshewana. We stopped at the Blue Gate Restaurant. We had wanted to eat there in 2010, but the place was mobbed with seniors who arrived on buses. This time we waited about 3 minutes. We had a wonderful lunch. Bob had the fried chicken with some delicious onion rings. I had the soup/sandwich combo of chicken noodle and a half BLT. I ended up taking the sandwich home. After lunch we wandered around the shops. I found some curtains for the MH that I liked. Bob is trying to figure out how we would hang them. We stopped at Yoders Meat and Cheese. We bought some marinated pork chops and some lime pickles. 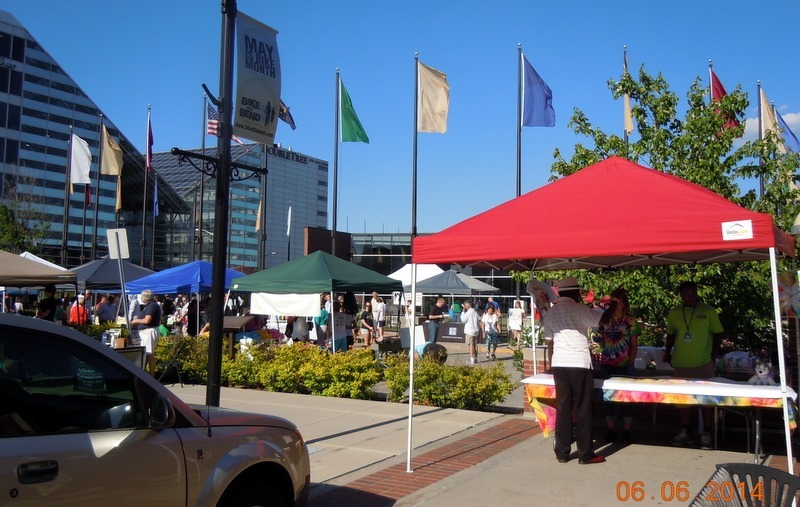 We returned home, Bob walked the dogs,and we took the dogs downtown to the South Bend First Friday celebration. This is a monthly event. This months theme was the Dog Days of Summer. We took the dogs to enjoy the event. We quickly found a parking place. The event was about 3 blocks long. 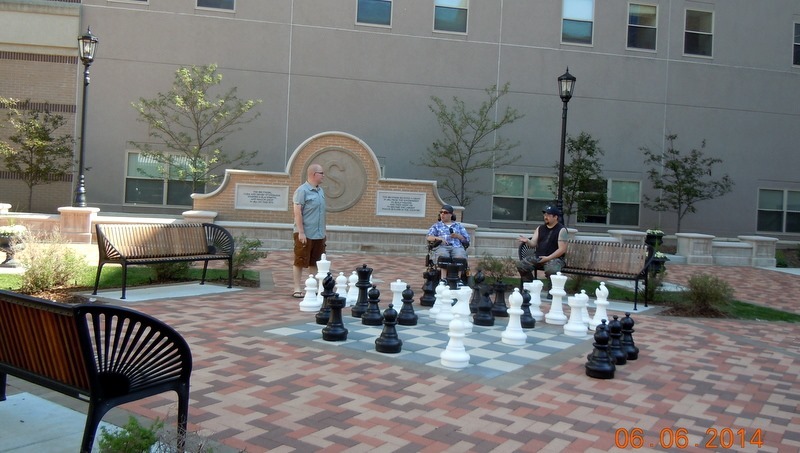 We passed this park with folks playing chess. 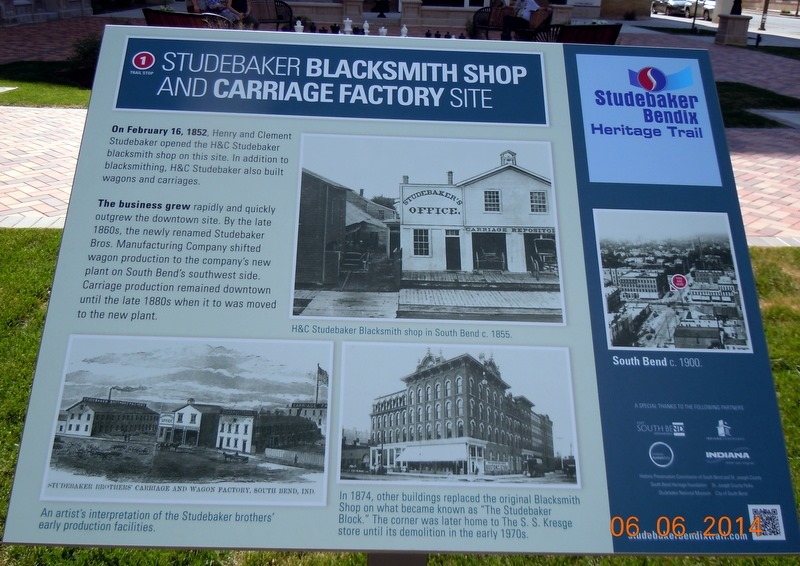 The park is on the site of the original Studebaker factory. We passed several restaurants which had outdoor seating. Many of the businesses put out water for the dogs and gave away treats. We crossed the street where they had tents set up with vendors. Vets, groomers, animal rescues etc. There was also an agility field set-up. 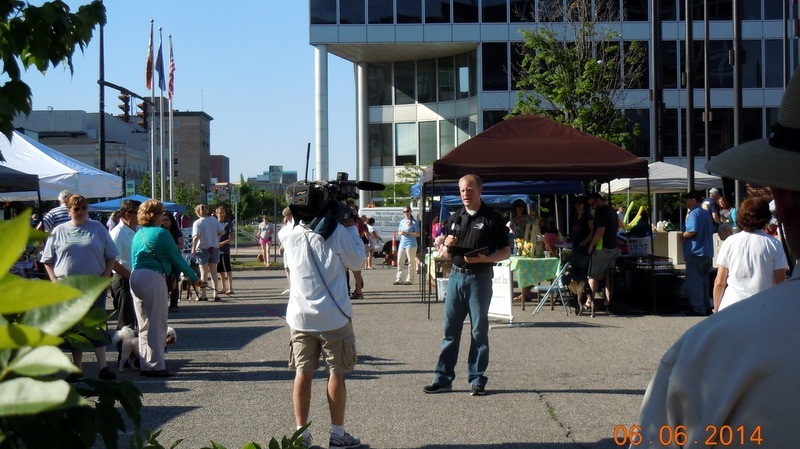 Above is one of the local reporters for a TV station who was broadcasting live on one of the stations. This silly costumed Dalmatian was mimicking this lady walking. We continued down the street, stopping to pick up treats, business cards, and coupons. 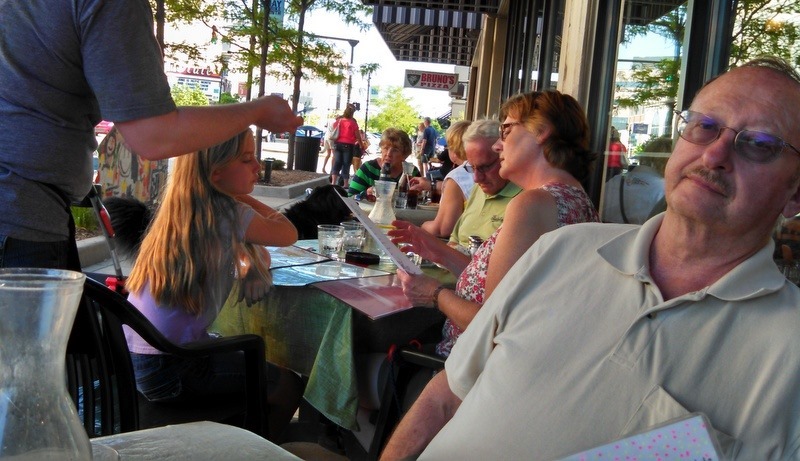 We crossed Main Street and back tracked to Le Peep Restaurant where we had dinner outside on the sidewalk. People would go by with their dogs and would stop to pet our pooches. 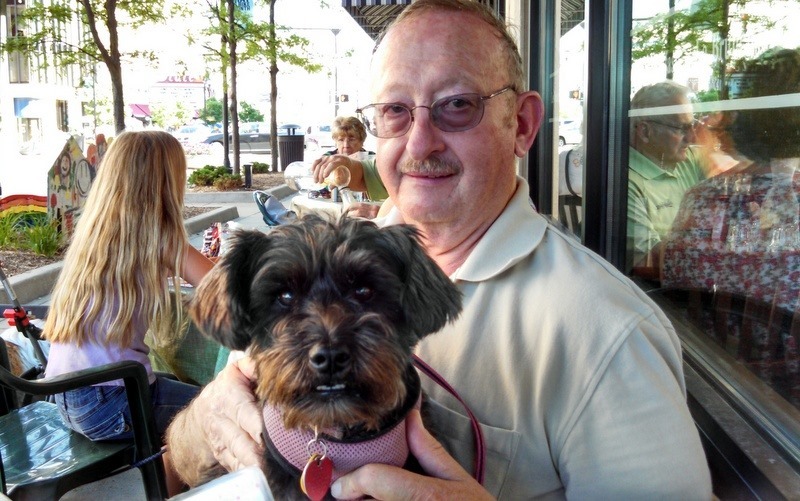 Here is Roxie on Bob’s lap while we were waiting to be served. She even has a little smile! After dinner we returned home with two very tired canines. We watched disc 3, Season 2 of Game of Thrones.